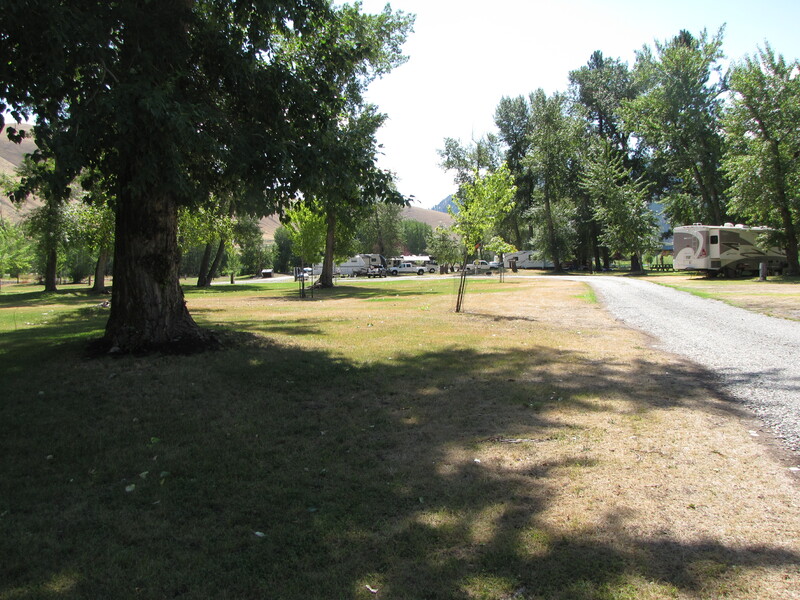 Oops, I forgot to put in the pictures of Wagonhammer RV Park from last post. So, here they are. 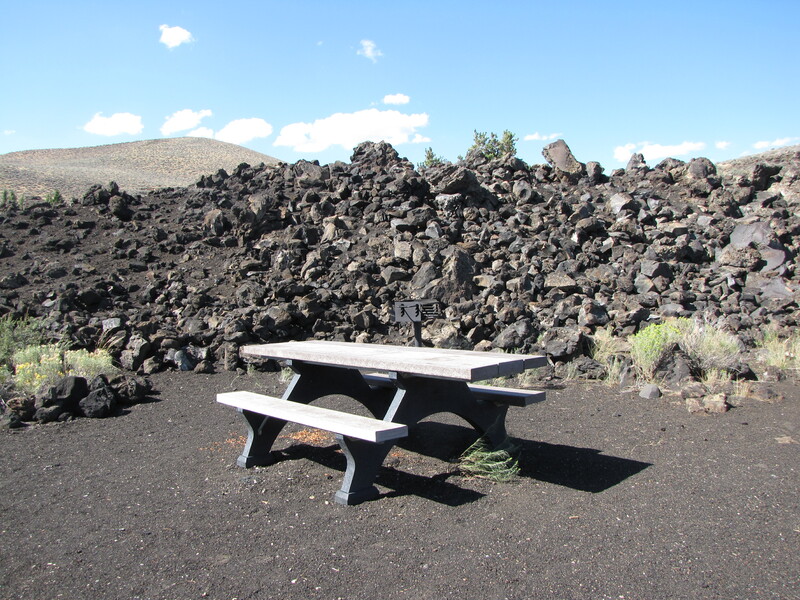 We continued on the 75 to the 20 to the 93 towards Craters of the Moon . 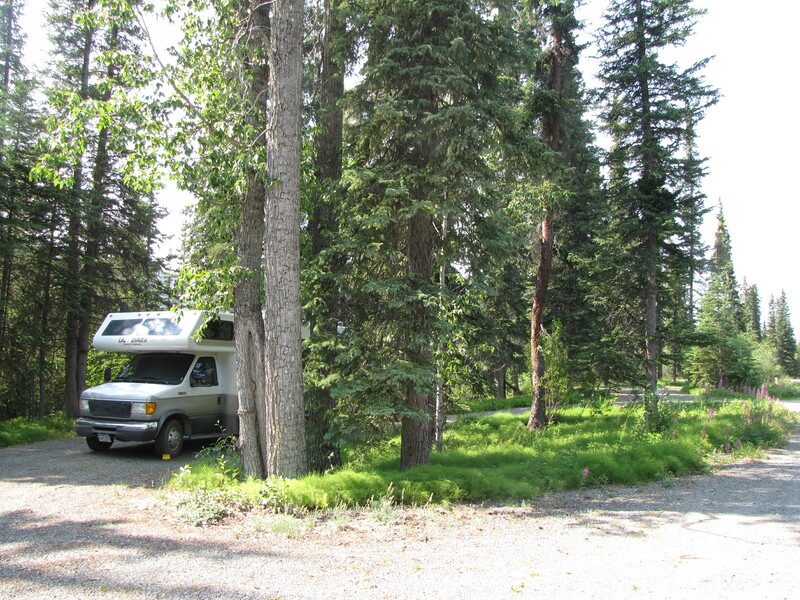 We have passed this campground many times but never stayed, so this time it wasn’t too hot and decided to try it. There are no hookups, but with the Pass you get into the Park and get to stay for $5. The place was really crowded but we got a nice spot and it was quiet. Back on the road we headed on the US 20 E towards Idaho Falls. We stayed at the Elks, which was a really empty place. There was only 1 car in the parking lot, which belonged to the bartender. The site had electricity, for $15 donation, and only one other rig came in. The best part is it was only a 2 minute walk to the best Mexican Restaurant we have ever been to – Marenita’s. 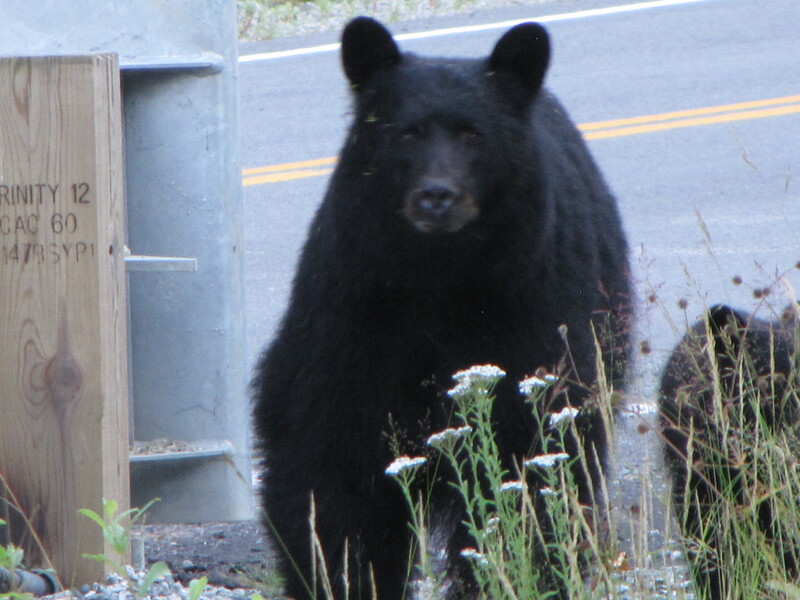 Our next destination was Gros Ventre CG so we decided to try going over the Teton Pass. One person said don’t do it, it’s horrible, and another said it wasn’t so bad. Since we weren’t towing we decided to try it. 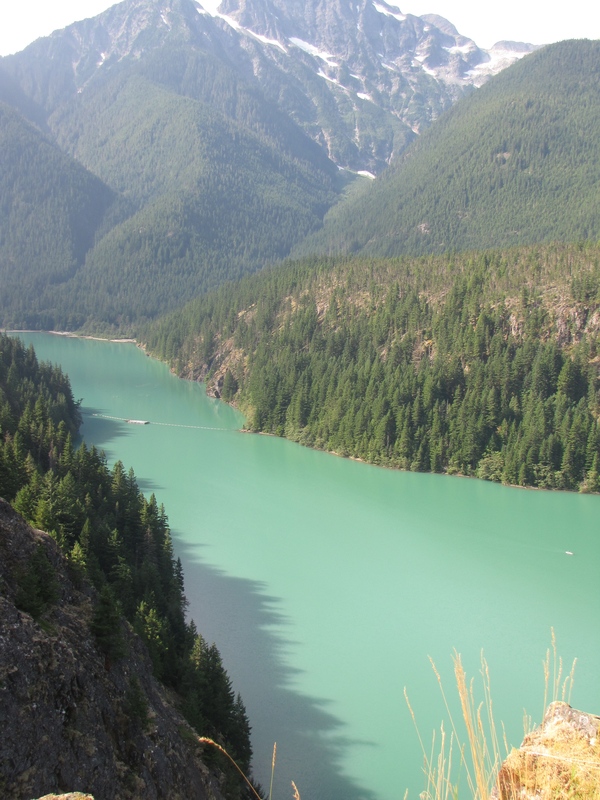 John said he definitely wouldn’t do it towing – a 5- mile 10% grade. And, there was a bicycle race so there were hundreds of bicycle riders going up from the Jackson side and going down the other side. 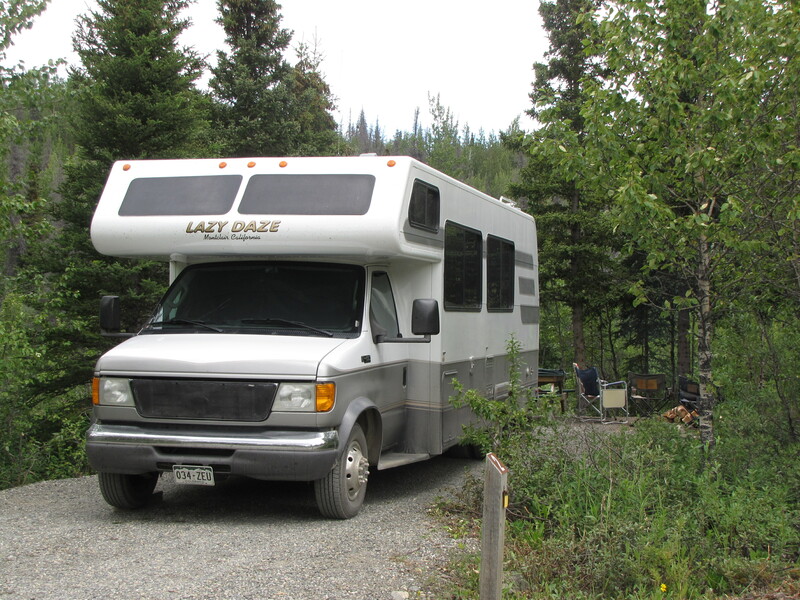 When we got to Gros Ventre, there were 4 other Lazy Daze rigs there. We got into Site 96, which was just across from our friend, Ken. While we were there 2 more Lazy Daze came in. 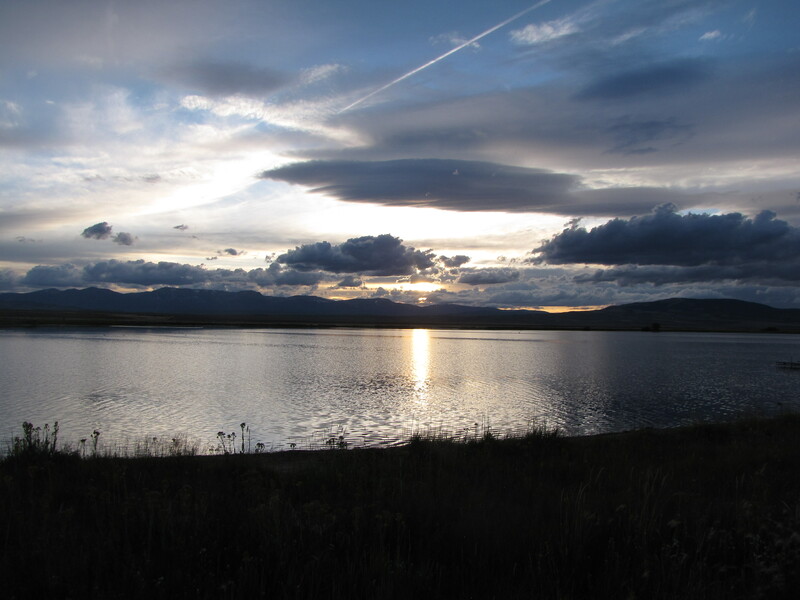 We stayed 3 days and then headed out on the 89 and then 189 E towards Pinedale, WY. 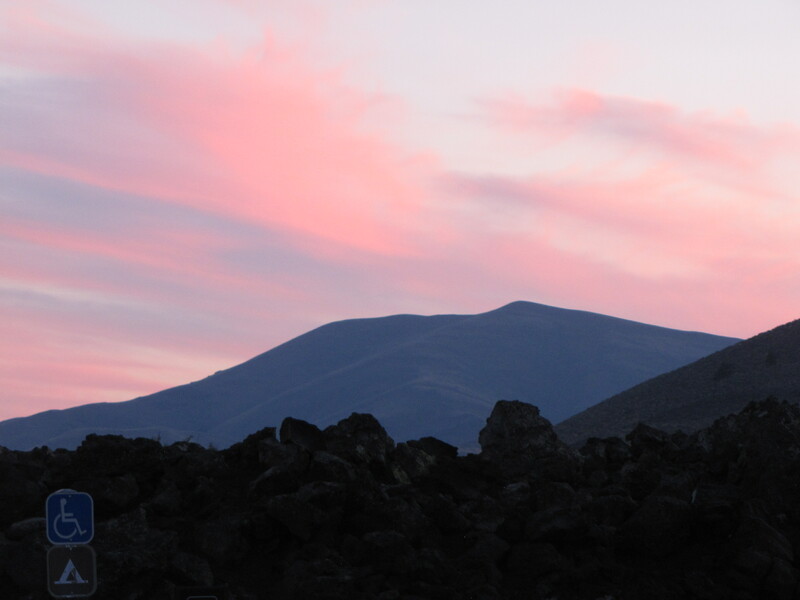 A couple who we were friends with in Kauai now live in CA and are building a second home in Pinedale. We stopped in to visit Tom and Jeanne, and their wonderful daughter, Paige. It was good catching up with them. Leaving Pinedale we headed on the 191 towards Rock Springs, where they have a Cafe Rio (a great fast food Mexican restaurant) and a Starbucks. We took advantage of both before heading on to Fireman’s Memorial at Flaming Gorge. 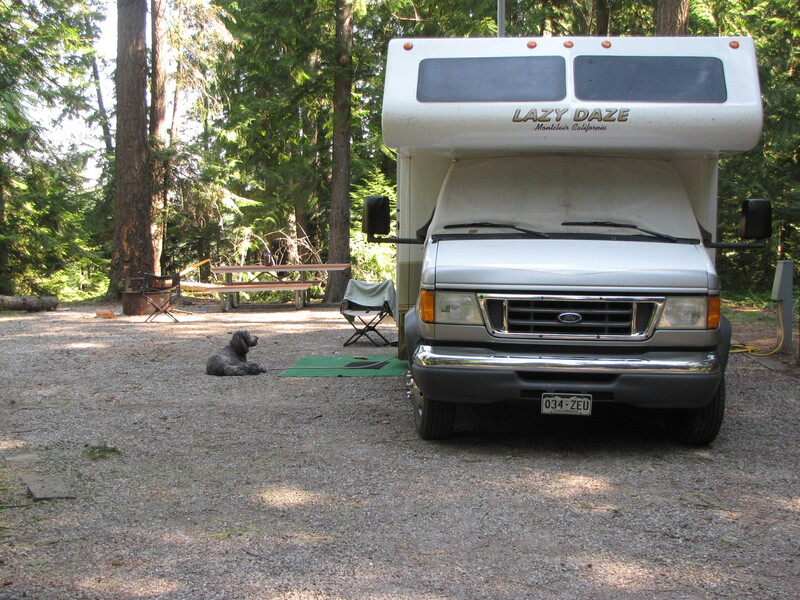 We have stayed here many times because it is a good stopping place between Gros Ventre and Colorado. 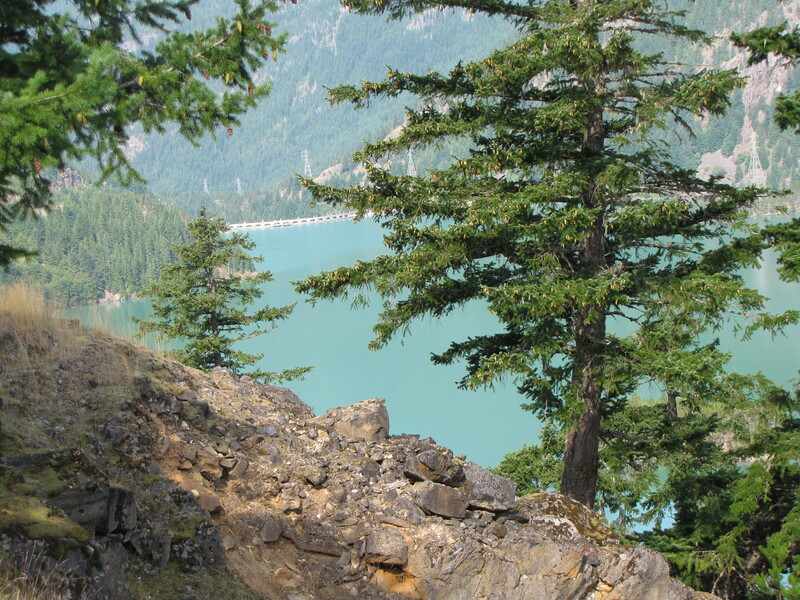 We had intended to stay at Chambers Lake, where we have stayed many times. But it was kind of cold, and it’s at 8000 plus elevation so decided to skip it this trip. 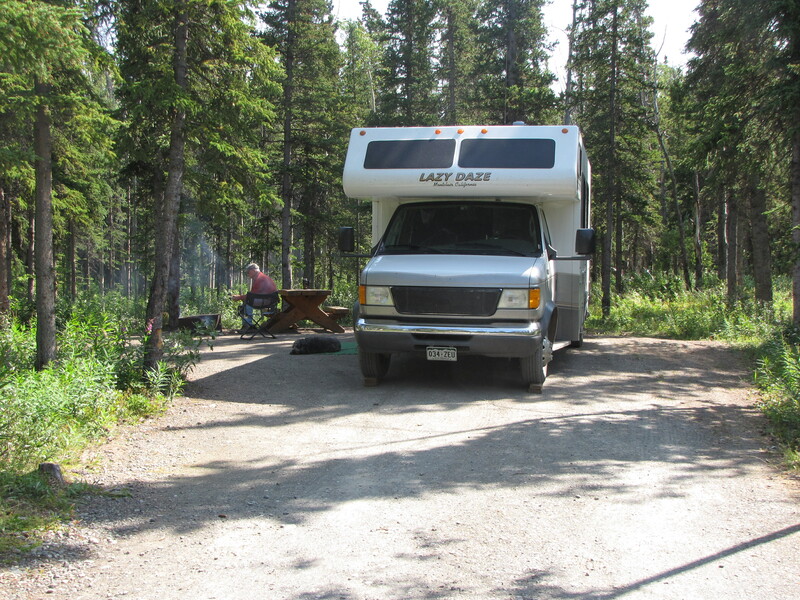 Instead we stayed at Cowdrey Lake, the place we stayed on our first night out heading on this trip. We were the only ones here until late in the evening and then 2 motorcyclists came in. It is free, and has great views. 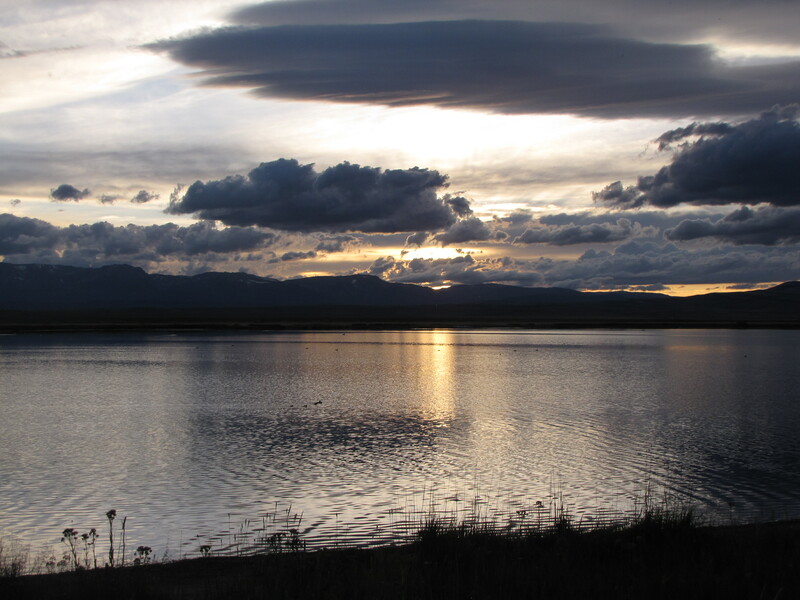 We continued on the 14 towards Ft. Collins, and then on the 25 South to Longmont to pick up our car. We really thank Ed and Carol (and Gopher) for keeping our car while we were gone. From Ed and Carols we headed to the Elks in Westminster, CO. 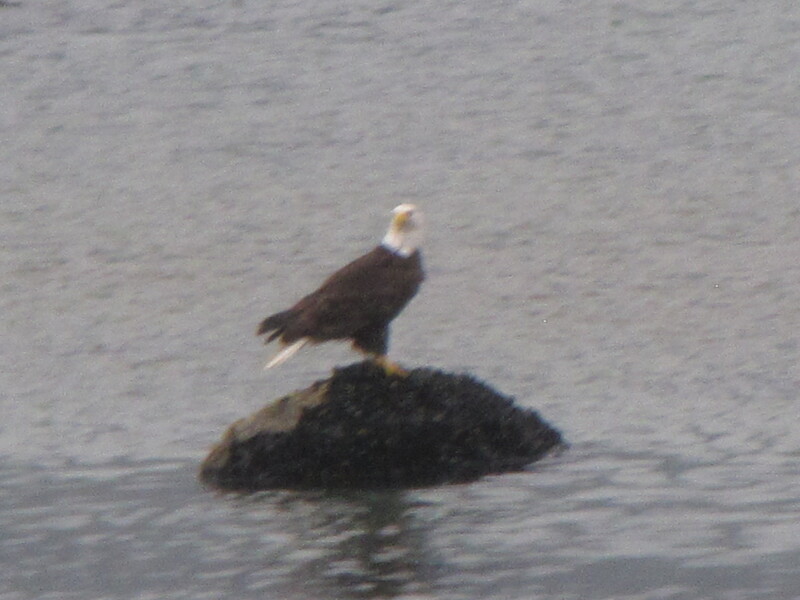 This is where we were staying before heading to Alaska. It is much more crowded and we got the last electric site but it’s down in the parking lot. We don’t mind it because it’s not crowded like the other spots. We will probably be here until the end of October when our new house is supposed to be finished. 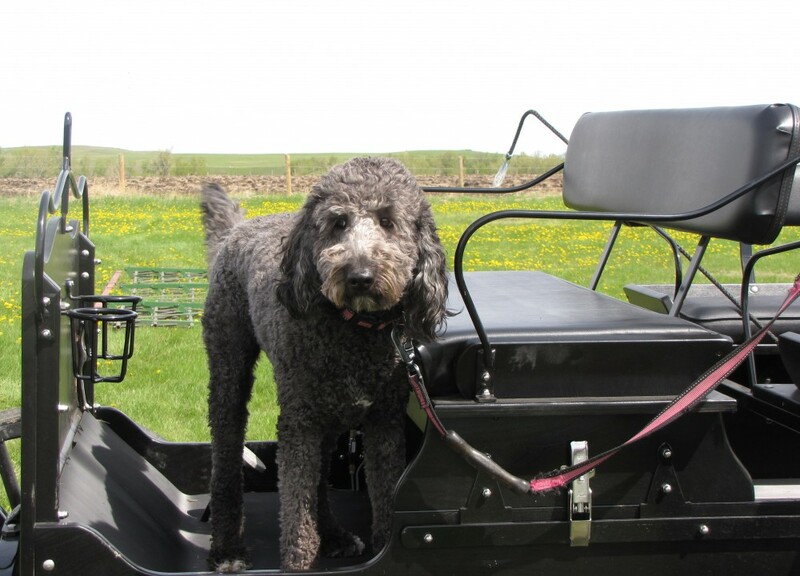 Jim is hosting at Panorama Point and he had held a site for the Caires and us. Here is where we again met up with Melinda. 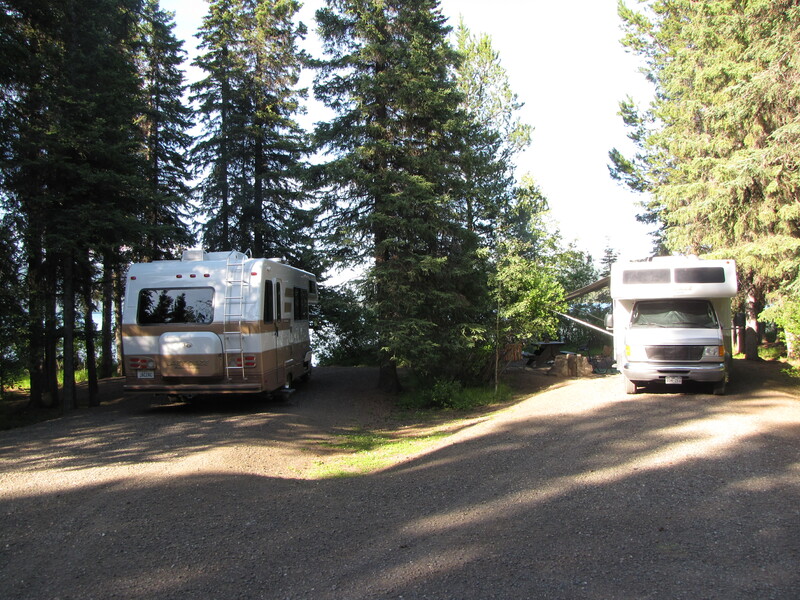 We shared a double site with John/Zoe and it was right on the lake. 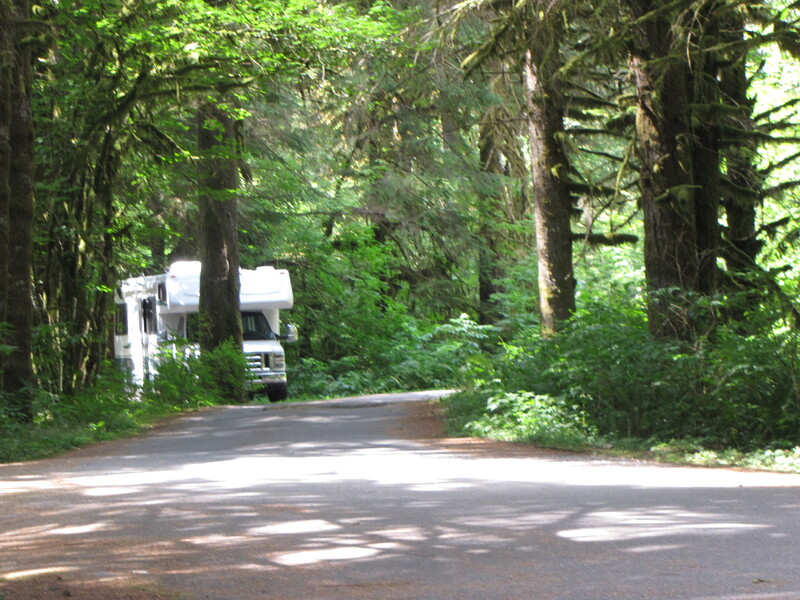 It is a nice campground in beautiful scenery. Not very good cell or internet, and too many trees for satellite. It was fun visiting with Jim. He works very hard but is enjoying the job. We ended up staying 3 days rather than the 4 we had originally planned. A large group of teenagers, adults and unleashed dogs moved into us and were noisy until midnight, so headed out. Melinda stayed on, John and Zoe headed to Oregon and Washington, and John and I headed on the 20 to Idaho. The drive through Washington and then into Idaho (through Cascades) was beautiful, but very smokey because of multiple fires. 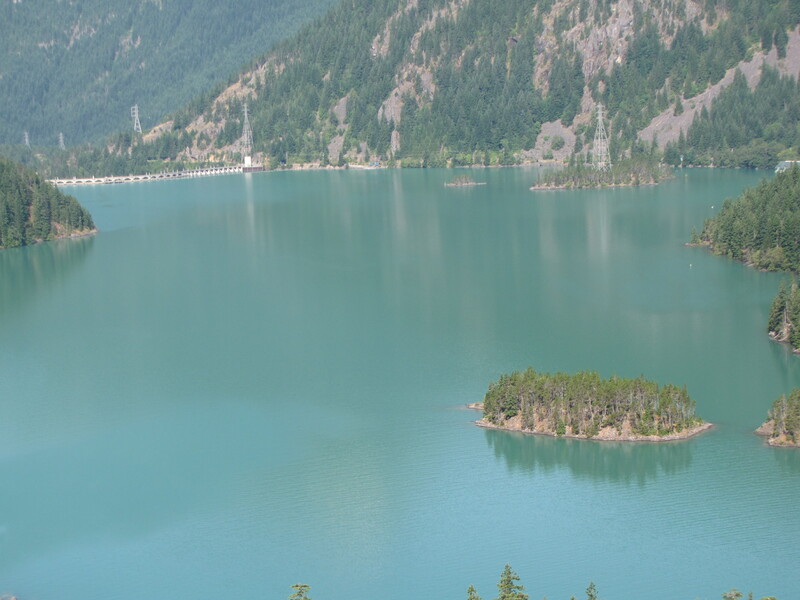 We passed a Diablo Lake along the way that was very pretty. From RaineyPass these are the pictures of the burned area. 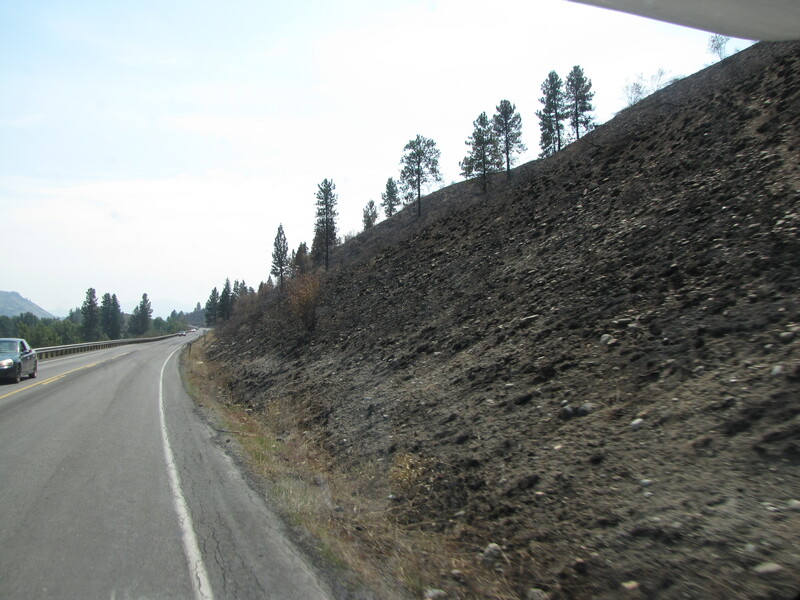 We continued on the 20 to Omak, then N. on the 97 to Tonasket, then East on the 20 to Kettle Falls. 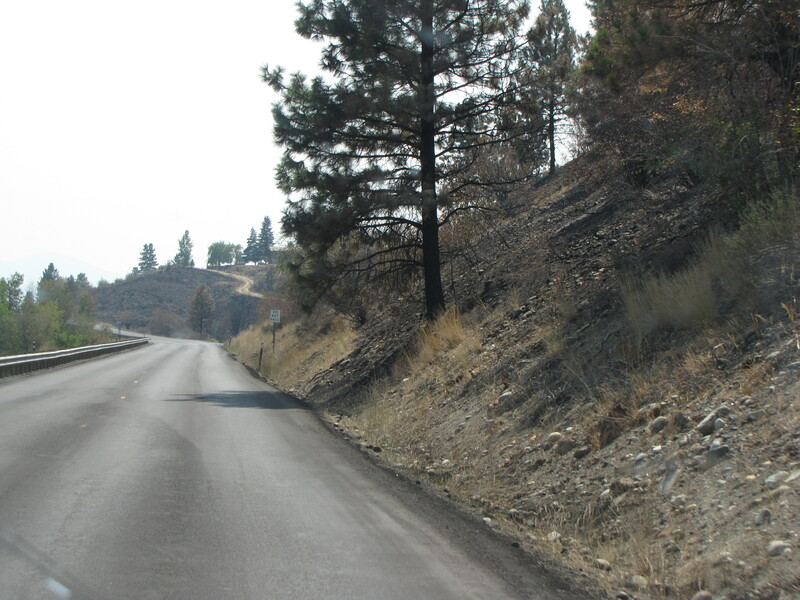 From Kettle Falls we took the 395 South for a short distance and then the 20 East to Pend Oreille County Fairgrounds. Very nice place, with hookups, but unfortunately we couldn’t get them. 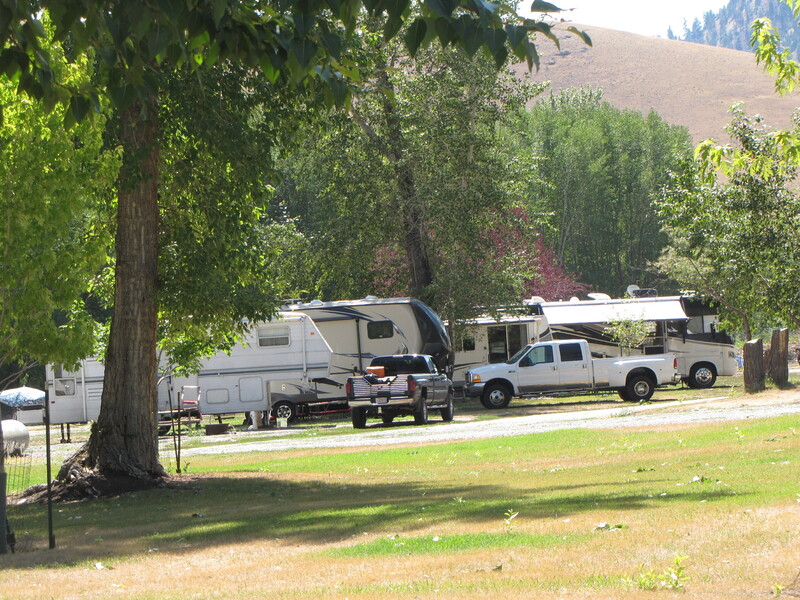 Their fair was starting the next week and all the hookup sites were taken by RVs that were brought in early to make sure they got a spot. Oh, well, it wasn’t too hot so we didn’t mind. It was really quiet with all the empty rigs!!! The next morning we headed out on the 20 East to Priest River, Idaho. 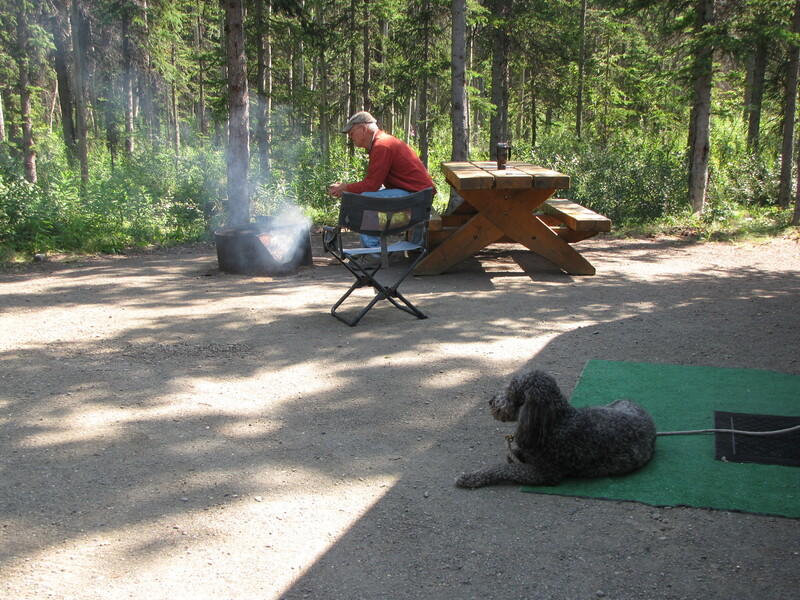 We like the Riley Creek campground and stayed here for 2 nights . 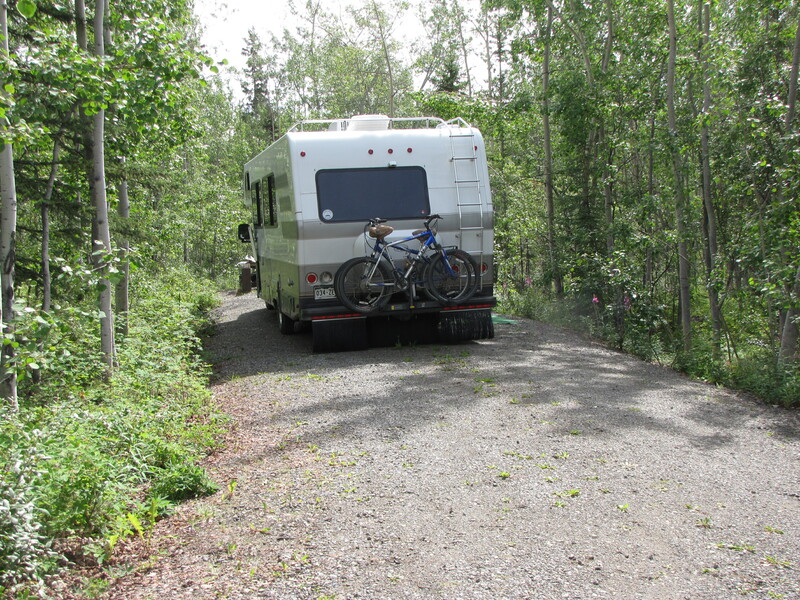 We had a great site backing up to the Priest River. 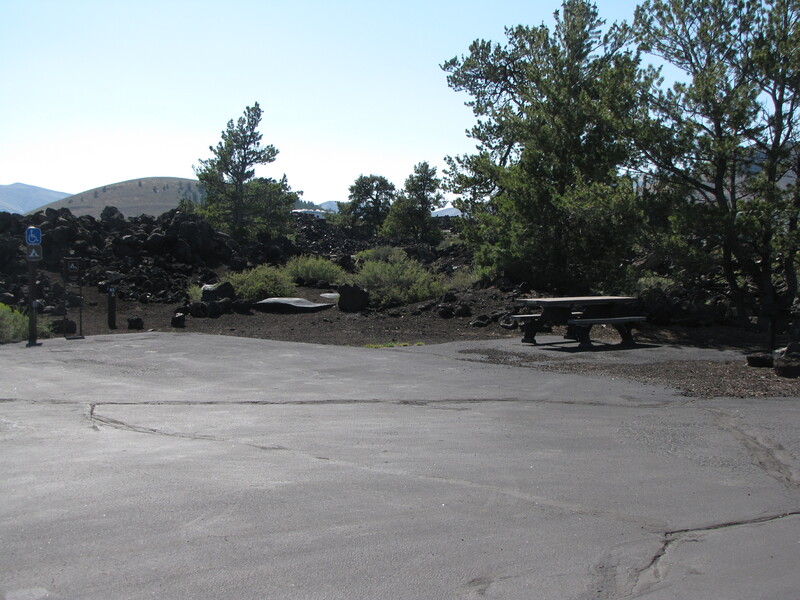 Again, a very quiet campground. 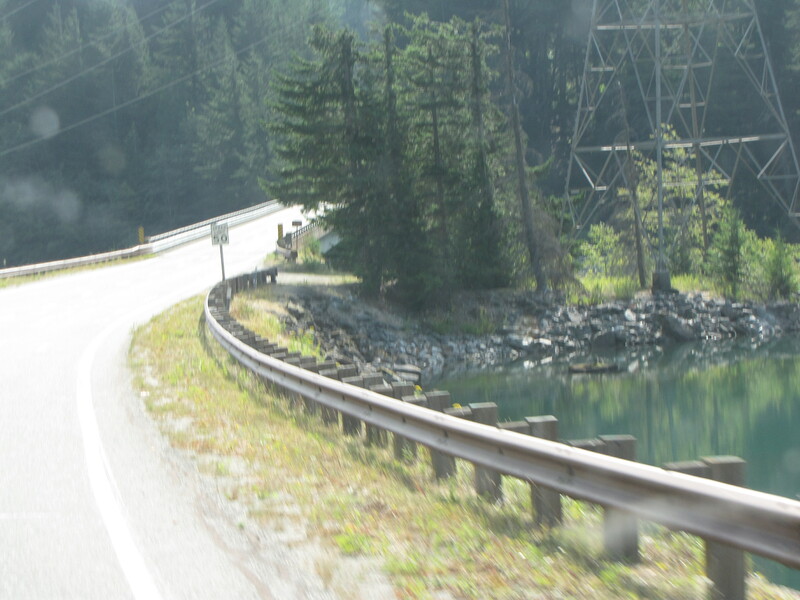 After traveling on the 20 East to Sandpoint, ID, we went on a road we had never traveled. 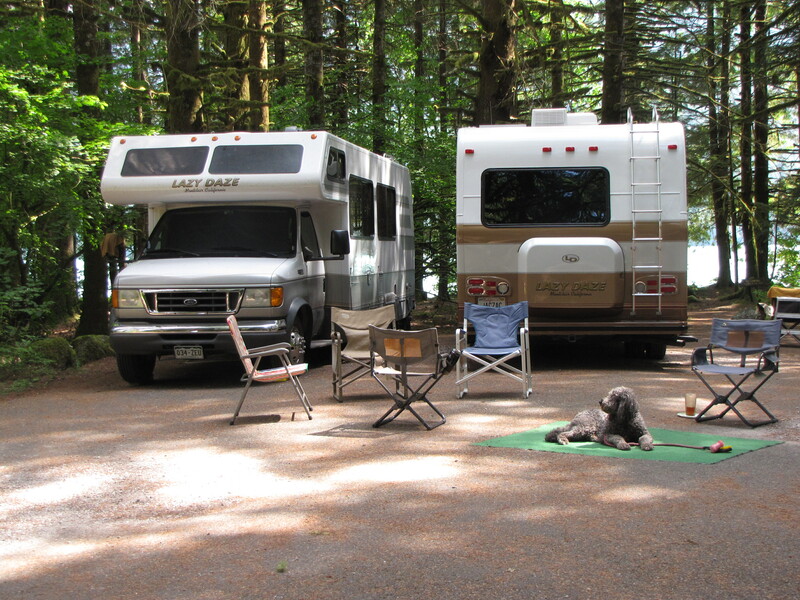 We headed East on the 200 and spent the night at Thompson Falls State Park. Funny thing, there are no falls!!! The place was pretty empty and quiet, except a distant train noise. 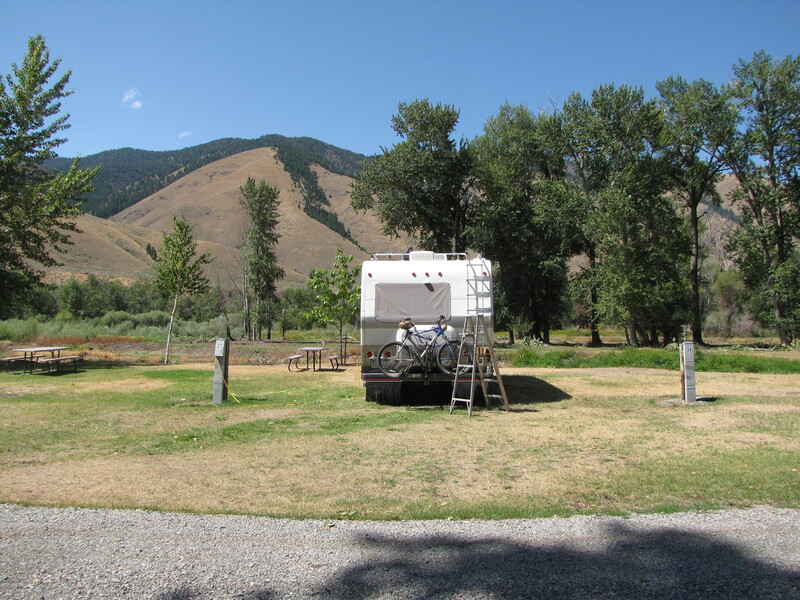 From this campground we headed North on the 200 and then 90 towards Missoula, MT. It was a really scenic drive. 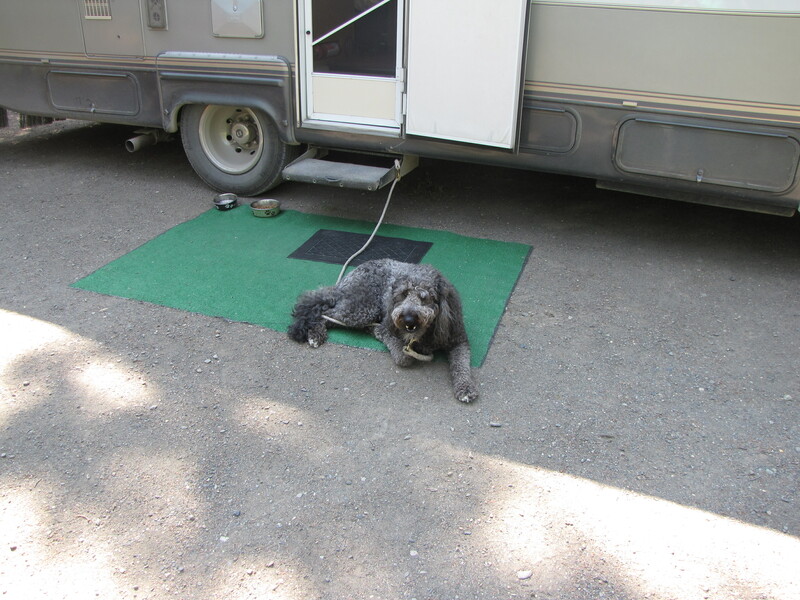 We made a stop at Costco and headed South on the 93 to Black Rabbit RV Park in Hamilton, MT. This is a really nice park, with the nicest showers we have been in. We ate breakfast at The Coffee Cup which I found on Yelp. We had a great breakfast. 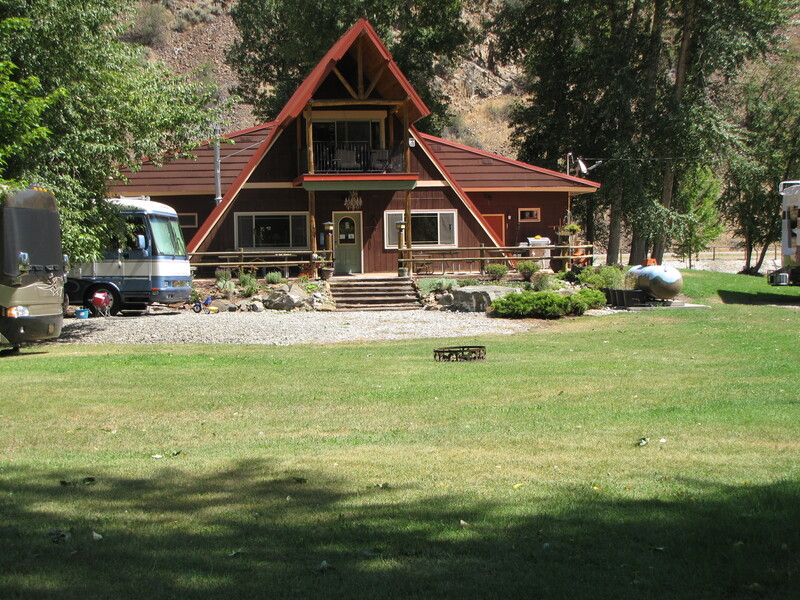 Another one of our favorite campgrounds is Wagonhammer in Salmon, ID. So, we headed on the 93 towards there. 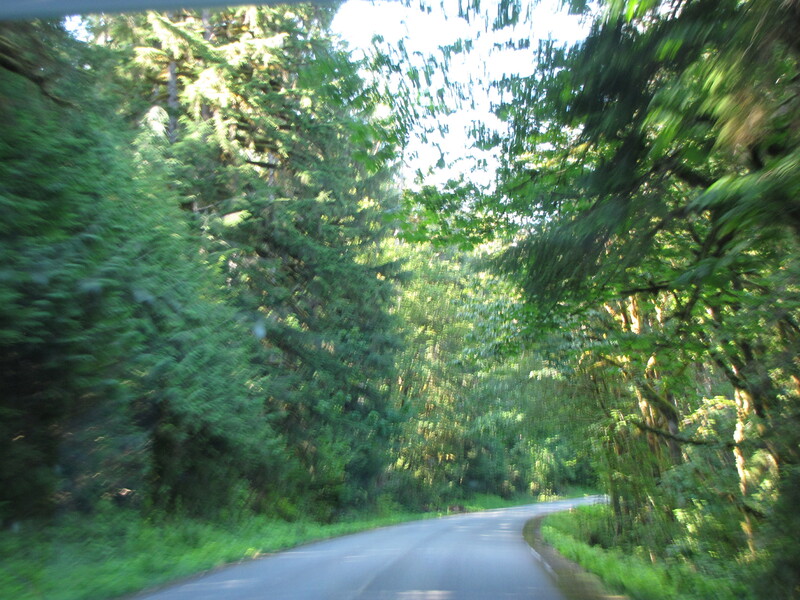 It was a very scenic drive, along a river, but kind of narrow. 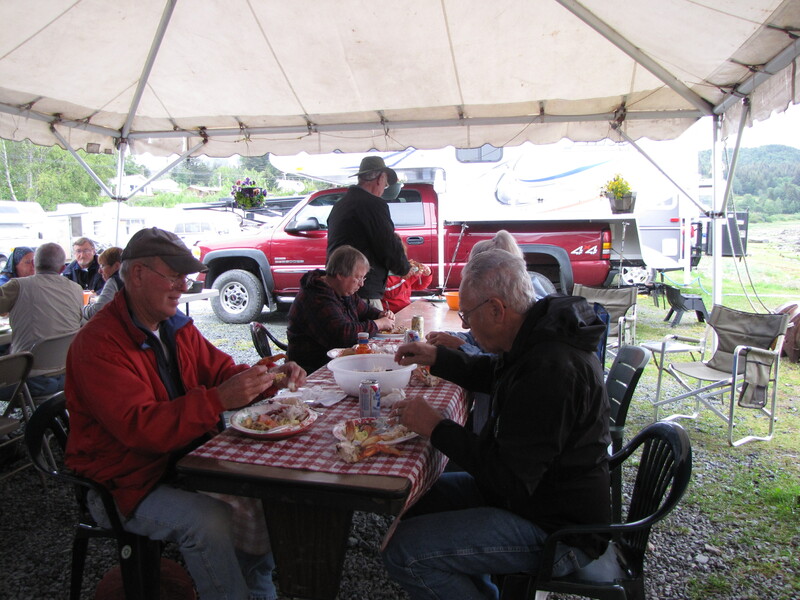 The owners of this campground are very friendly and it is a very nice place to stay. Their showers are even nicer than the ones at Black Rabbit, and they are free!!!! 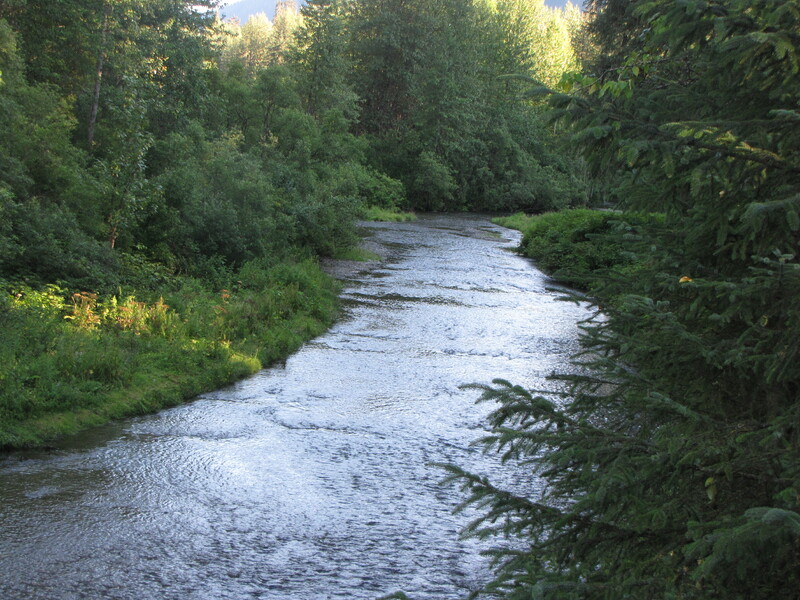 It is located right along the river, and there is a great spot for Sadie to run. 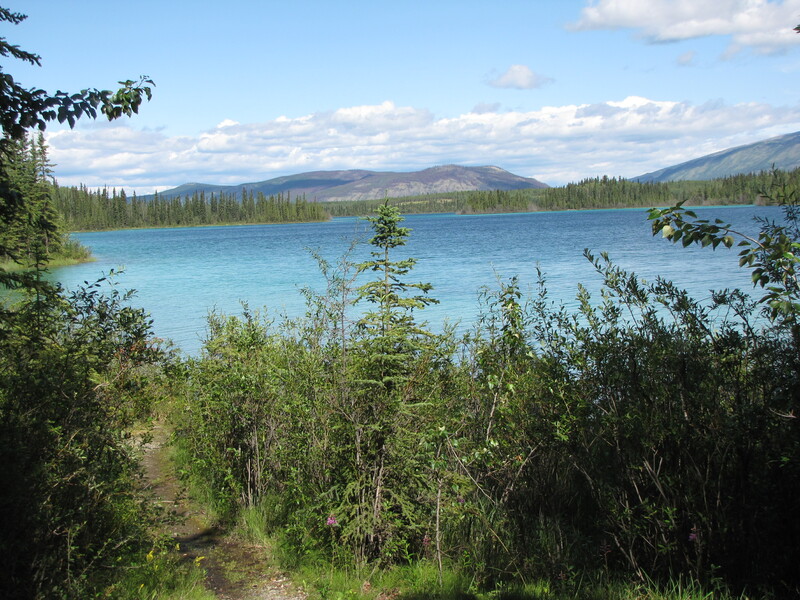 The next post will get us home to Elks in Westminister, CO.
We traveled the Klondike Highway, then the 8 East towards Taglish, and then the 1 East to Teslin Lake Yukon Government Campground. 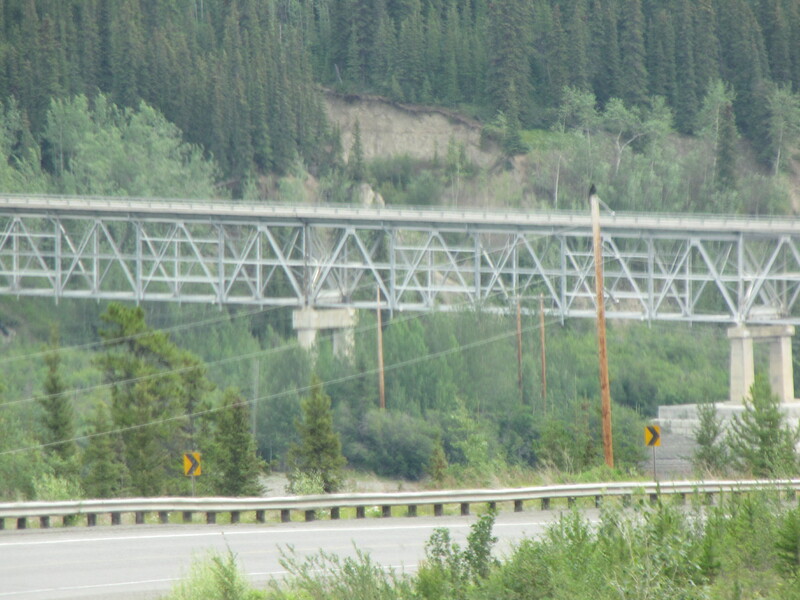 Along the way we came across the Teslin River Bridge which is the third largest water span on the Alaska Highway. 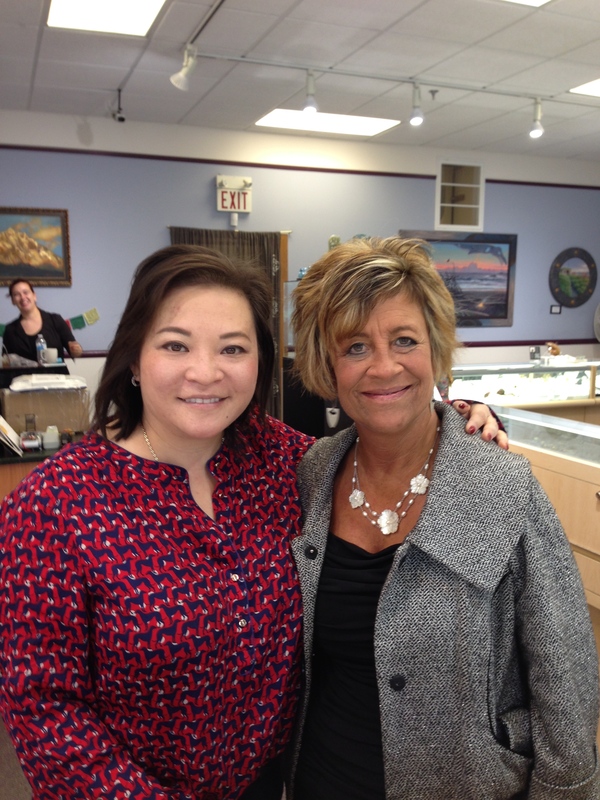 Here is where we met up with fellow LD owner, Melinda. She will be traveling with us back into Washington. 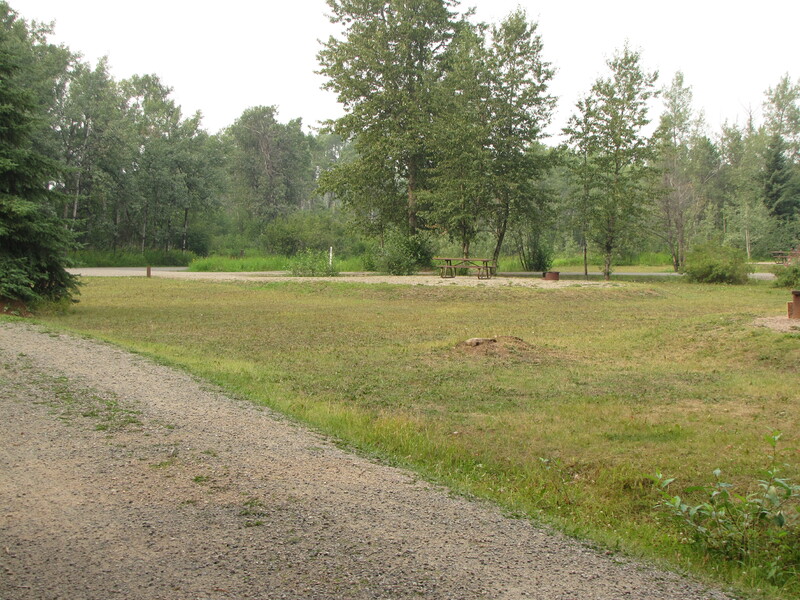 The campsites were nicely spaced with vegetation between and they offered free wood. The night was nice and quiet. 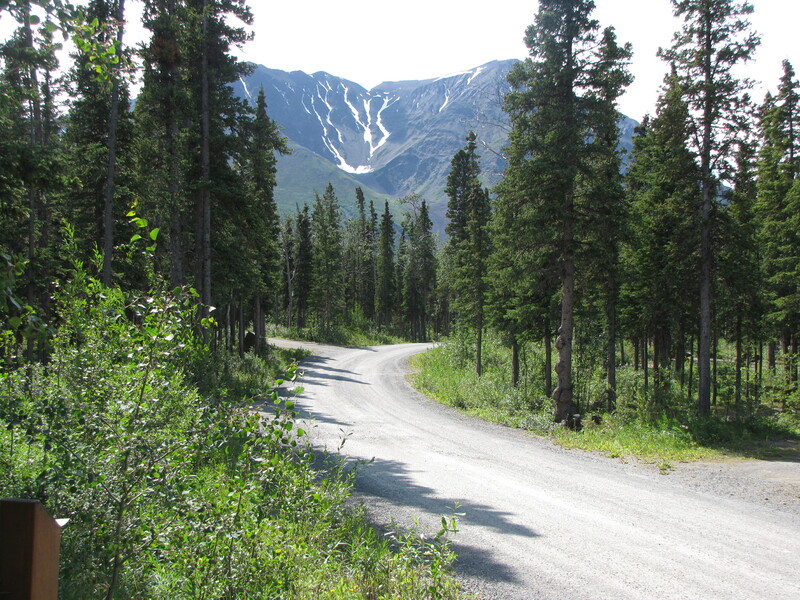 From here we headed East on Highway 1, which is the AlCan, to the 37 S., which is the Cassiar. 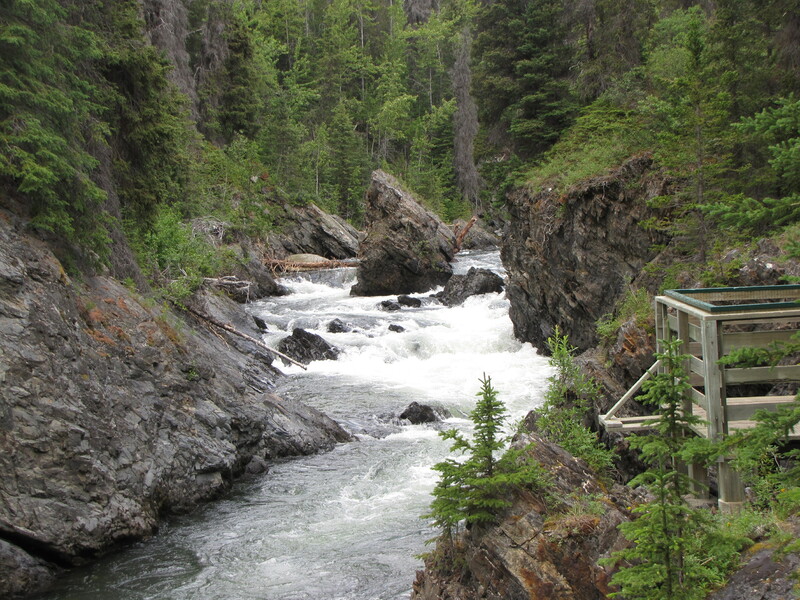 Since we came up the AlCan we decided to go home a different route. 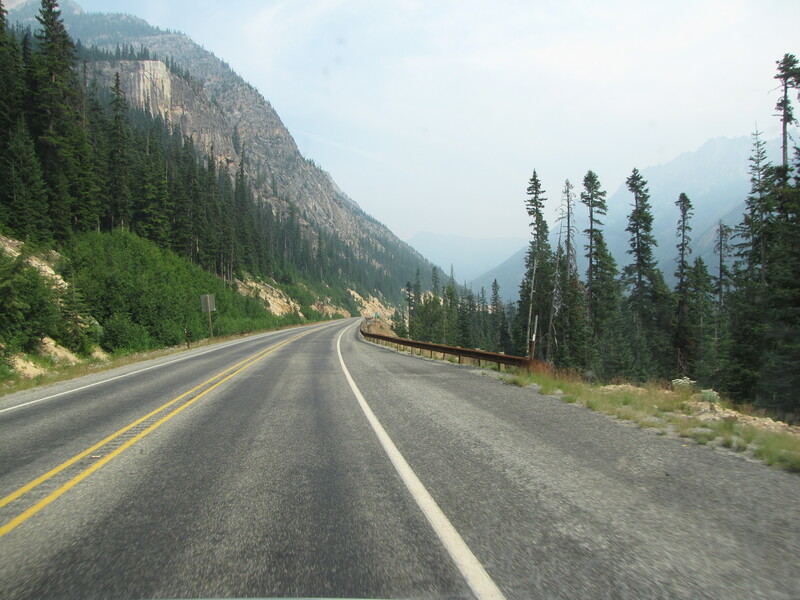 The Cassiar is supposed to be shorter in miles, but the beginning of it was a much slower drive – horrible road, ugly scenery, no lane lines, and no shoulder. 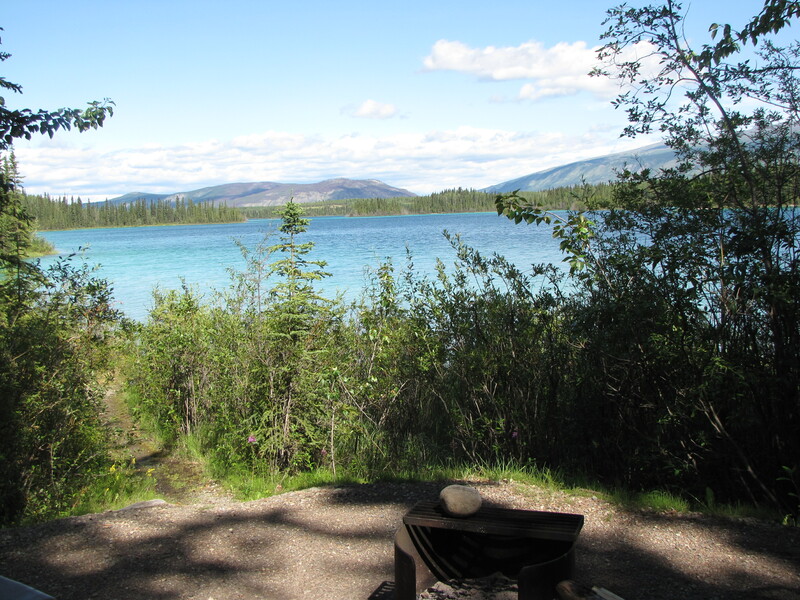 We headed to Boya Lake Campground, on the Cassiar. 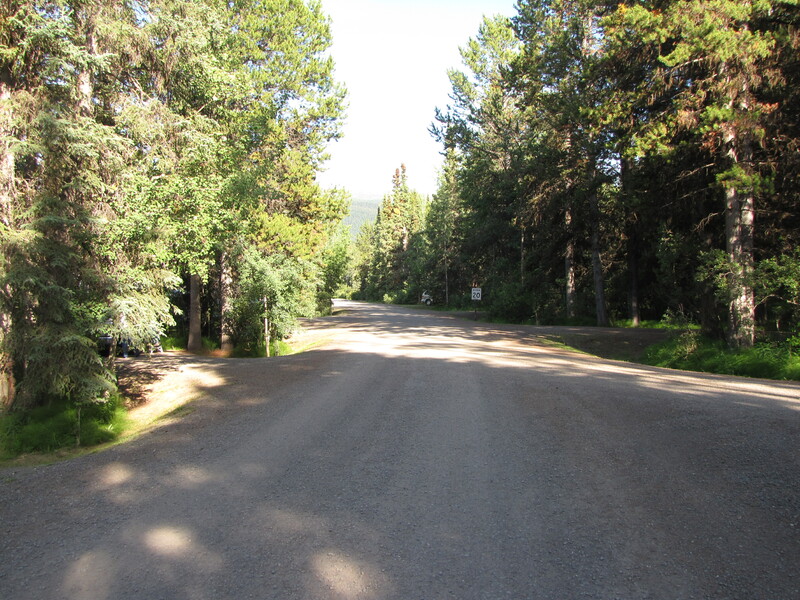 It was a really nice, quiet, very well maintained campground. We decided to spend 2 nights here. Contunuing on the Cassiar we headed to Kinaskan Lake Provincial Park. 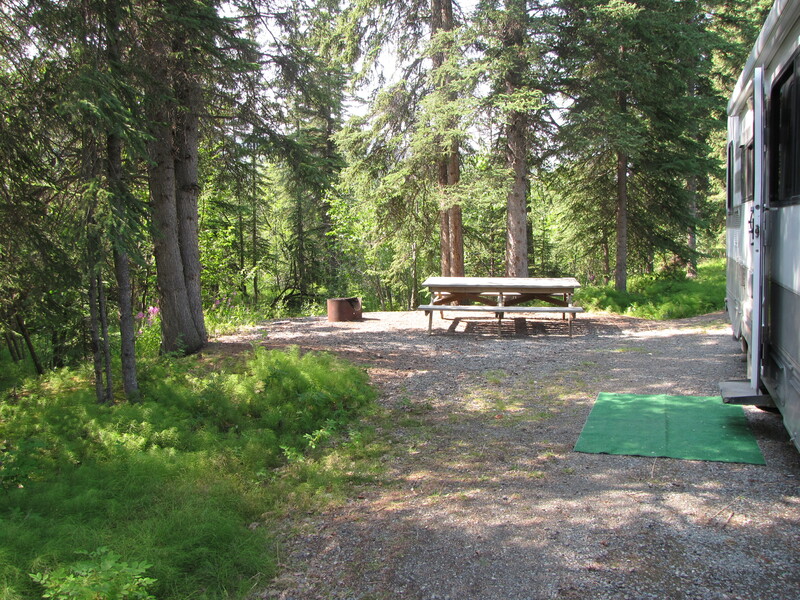 This campground was right on a lake, very level spots, and nicely separated by vegetation. Again we decided to stay 2 nights since it was so nice. 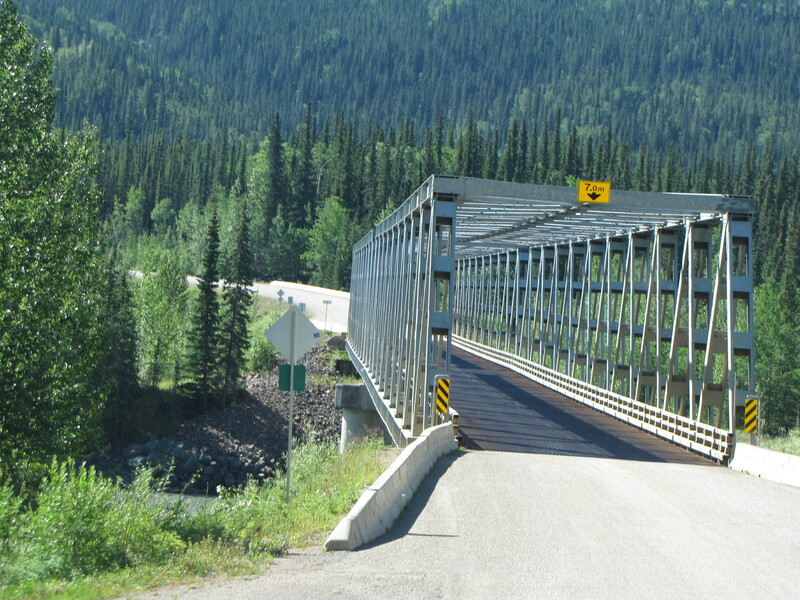 Along that road we came across a very cool bridge – Devil Creek Bridge. 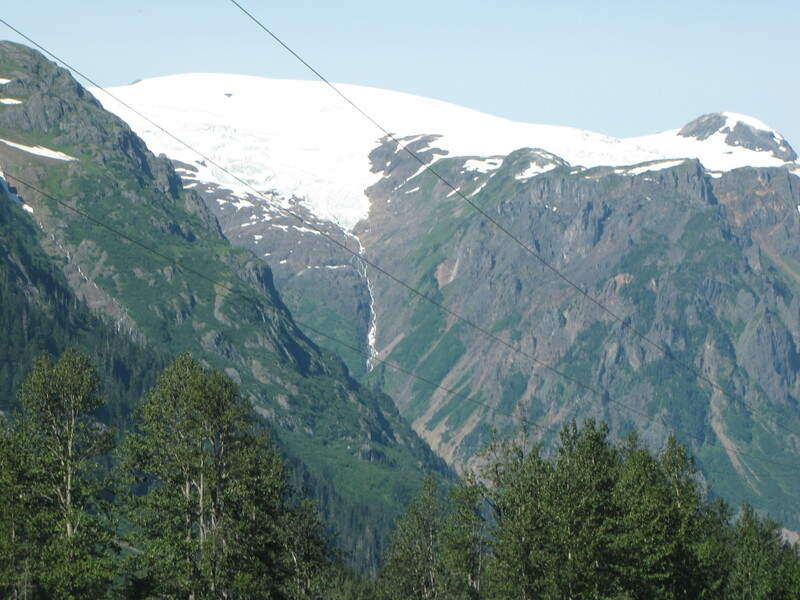 All along the Cassiar we saw this huge electrical project. I found out that they are constructing a 287-kilowat transmission line. 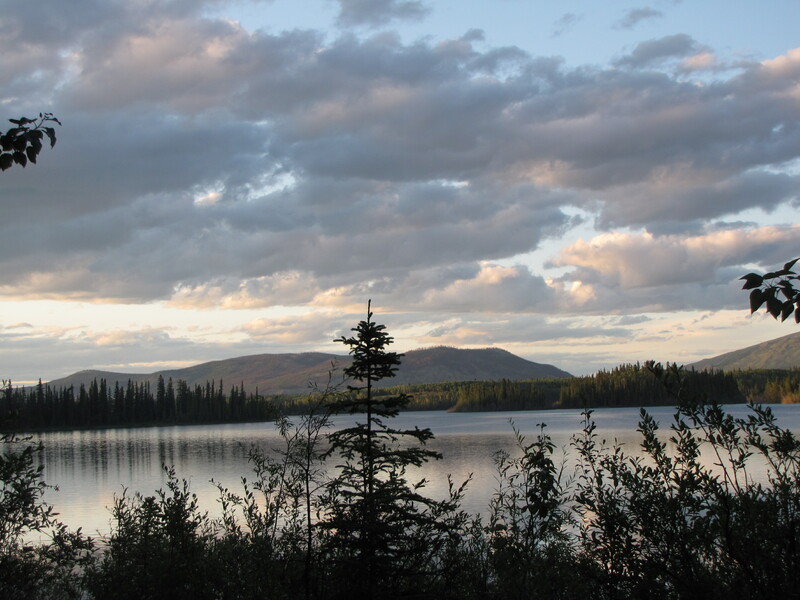 This line extends North to Dease Lake, providing power to the mining sector and local communities currently relying on diesel generators. 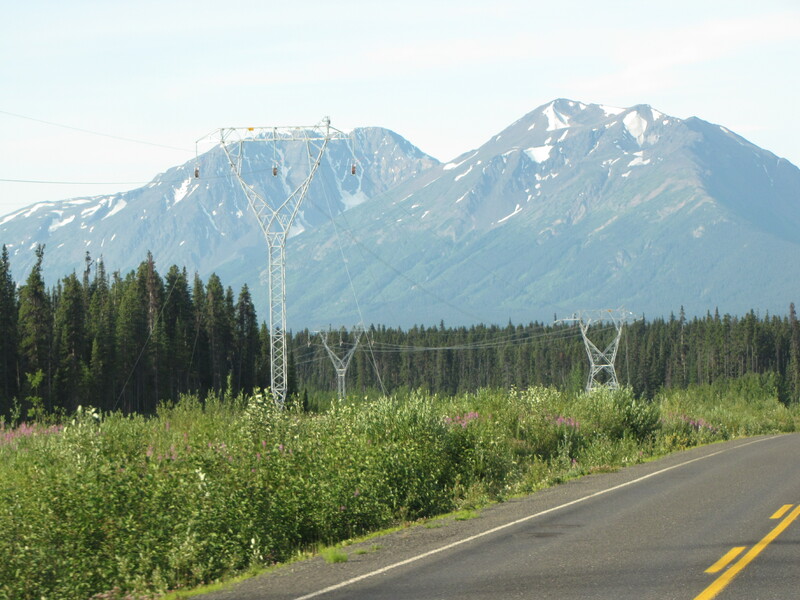 The 214-mile transmission line extends from the Skeena Substation near Terrace to Bob Quin Lake on the Cassiar. 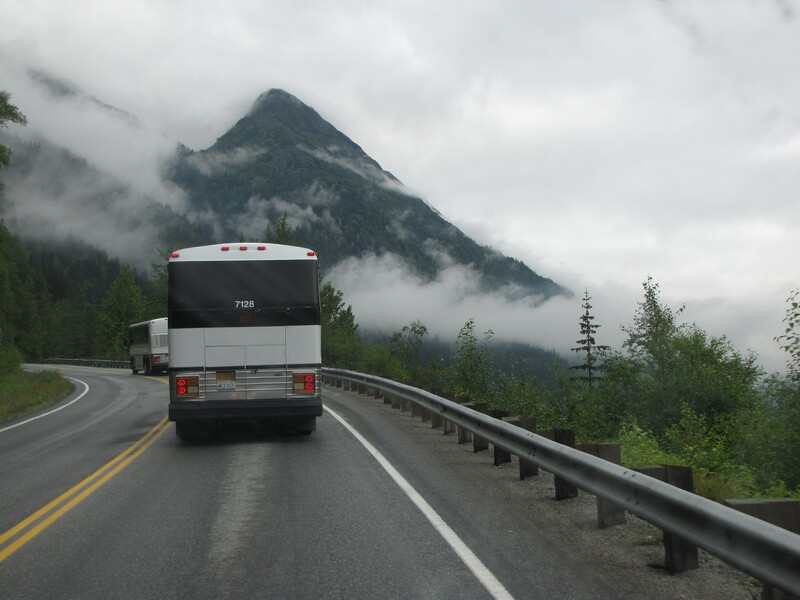 From the Cassiar we took the 37A towards Steward and Hyder. 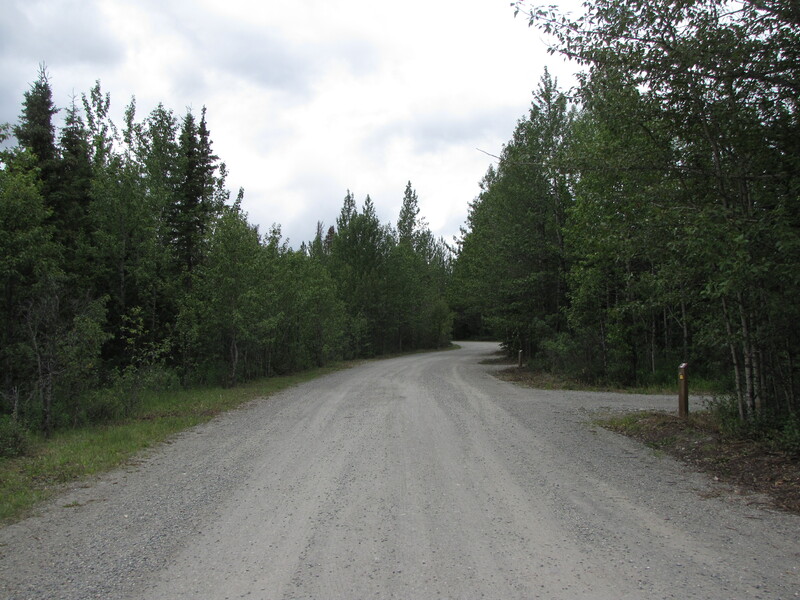 This is a 2-lane paved spur which leads 40.4 miles to Steward, BC, and then on to Hyder, Alaska. 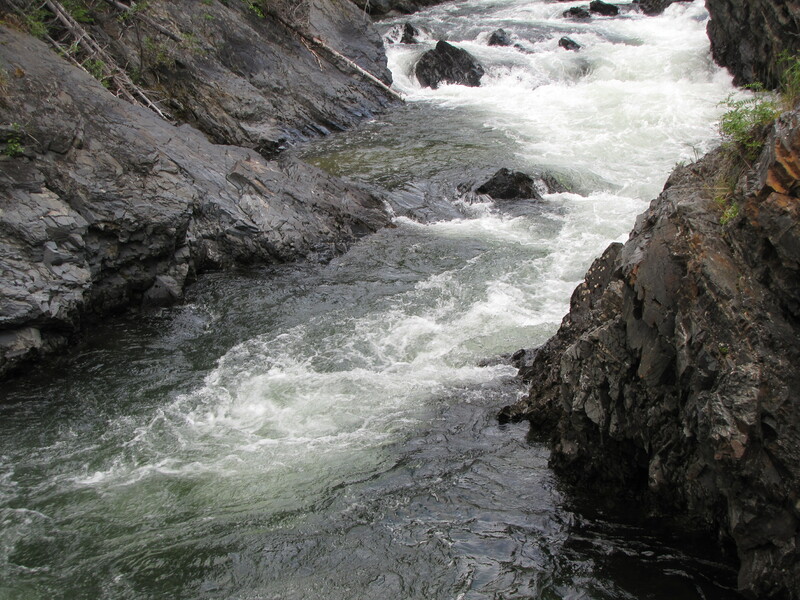 It winds through Bear Creek Canyon into the magnificient Coast Range Mountains. 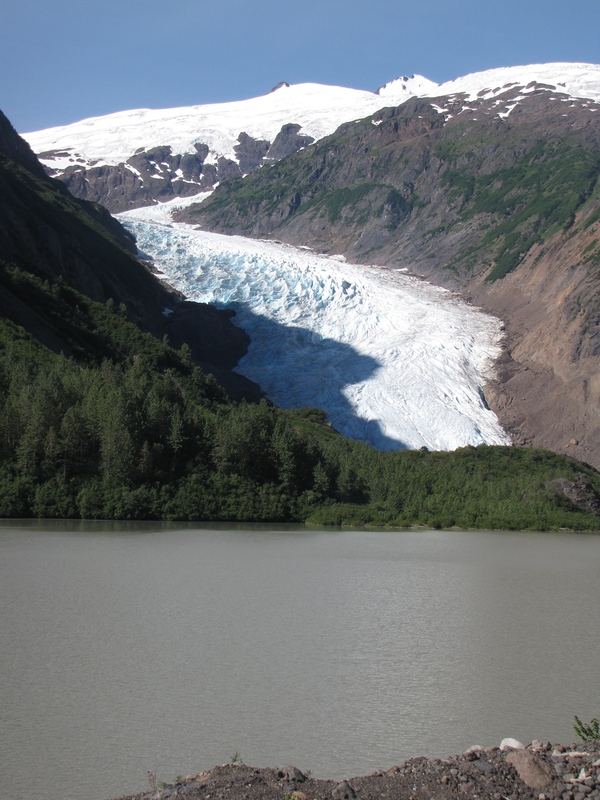 Major attractions are the Bear Glacier and Salmon Glacier. 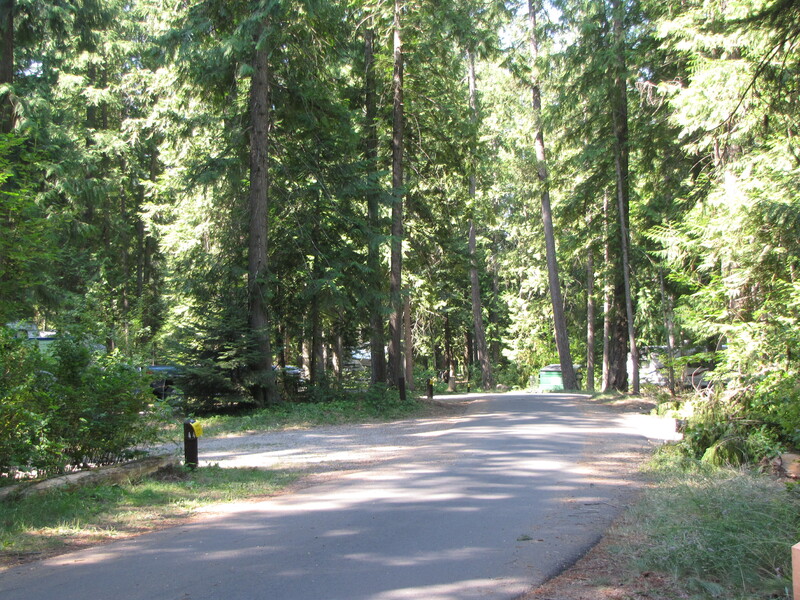 We we arrived at Stewart we checked into a very nice campground called Bear River RV Park, which has a laundry, nice showers, full hookups, and free fire wood. 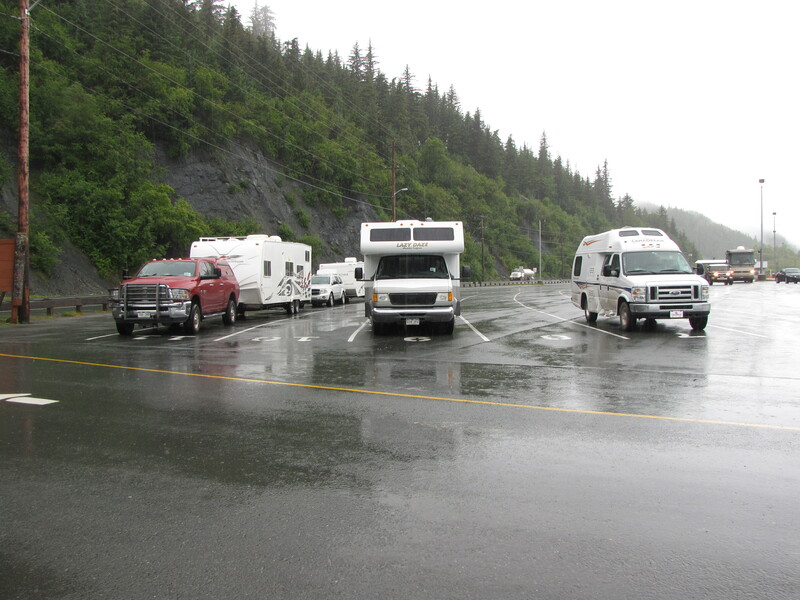 That night we all loaded into John/Zoe’s rig and traveled to Hyder, Alaska. 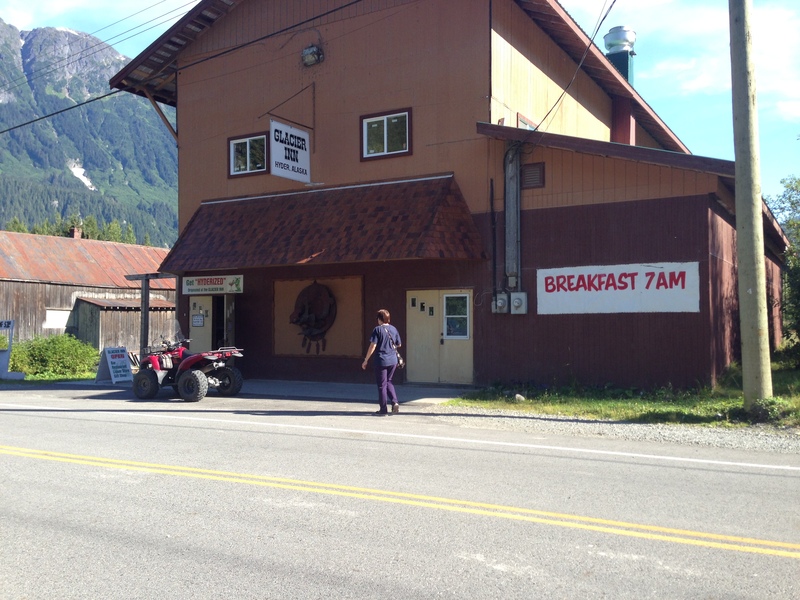 We stopped first at the Glacier Inn for fish and chips. 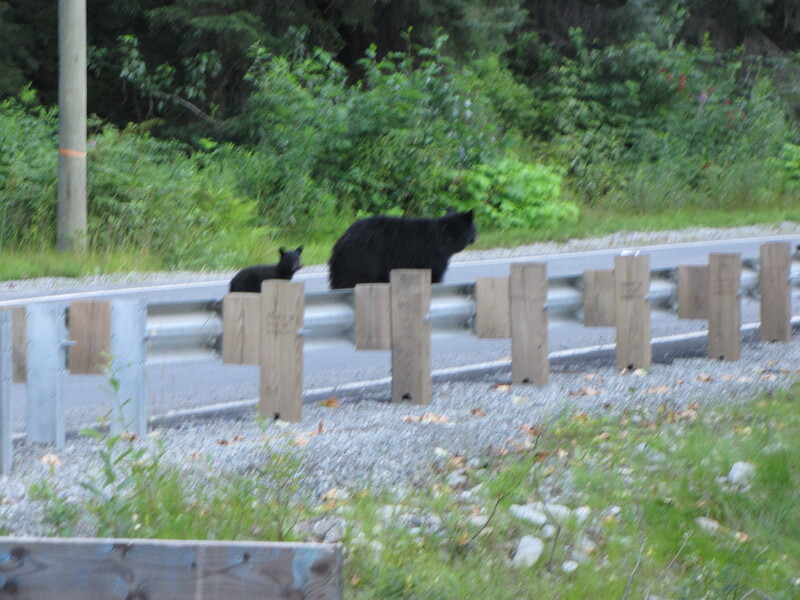 Then we headed to the Bear Viewing area in hopes of seeing bear, and we weren’t disappointed!!! 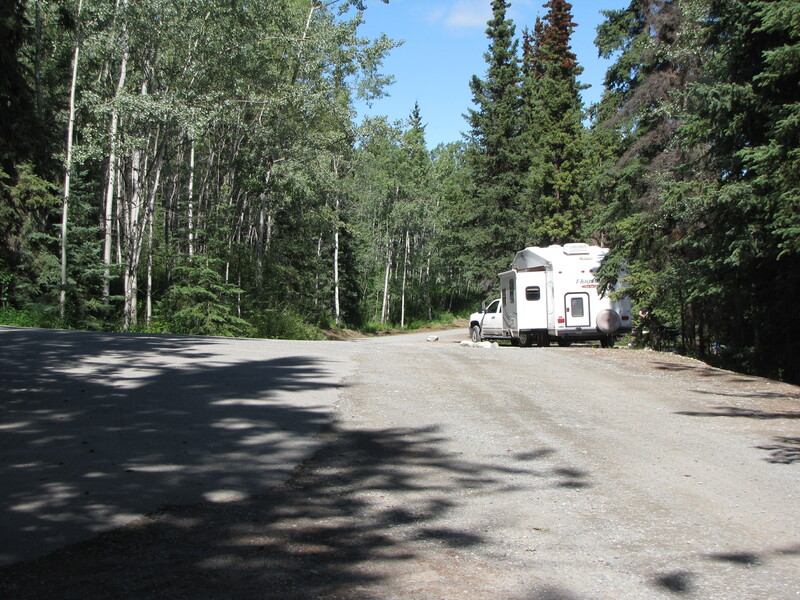 We left the campground the next morning via the 37A to the 37, Cassiar Highway. 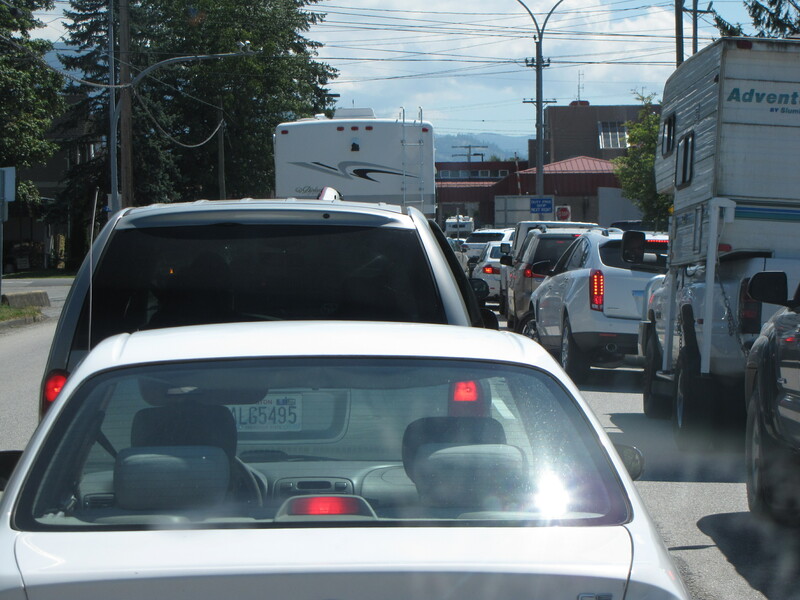 We then met up with the 16 (Yellowhead Hwy) towards Prince George. 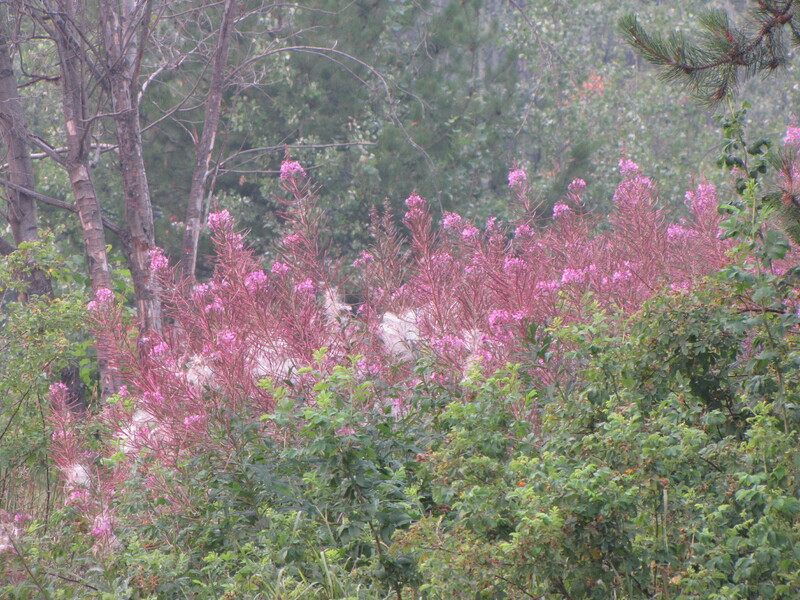 Saw some beautiful Fireweed along the road in Burns Lake. 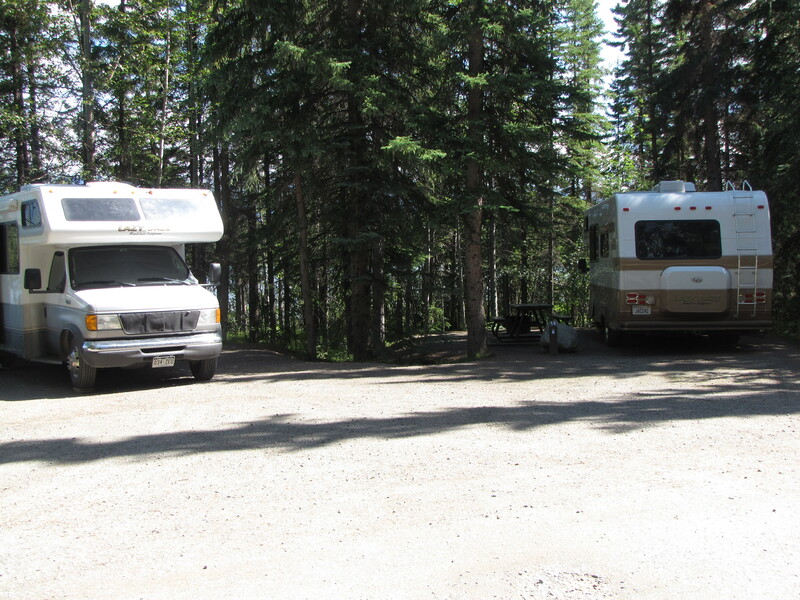 We are spending the night at Beaumont Provincial Park at Fraser Lake. 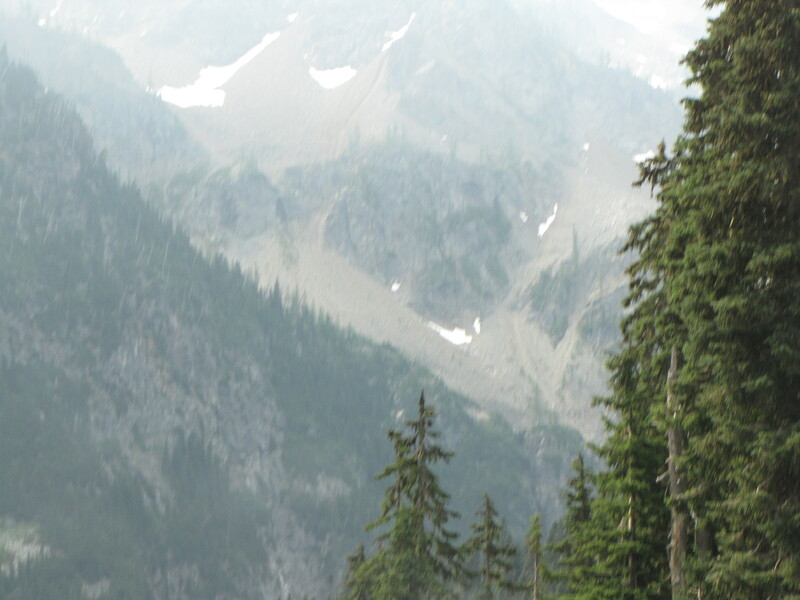 Rather smokey from BC fires, but sites are good. At this point Melinda decided to go ahead and meet up with us again in WA. 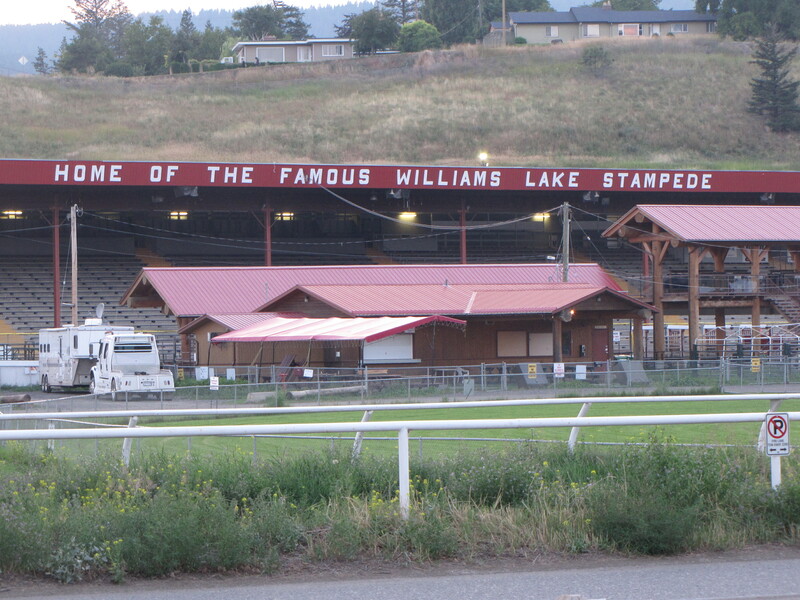 We headed into Prince George and stopped at a inadequately supplied WalMart, Costco and Starbucks Then back on the 97 towards our tonights stay – Stampede Campground in Williams Lake. This is a really nice fairgrounds with showers ($1 for 8 minutes!!!! 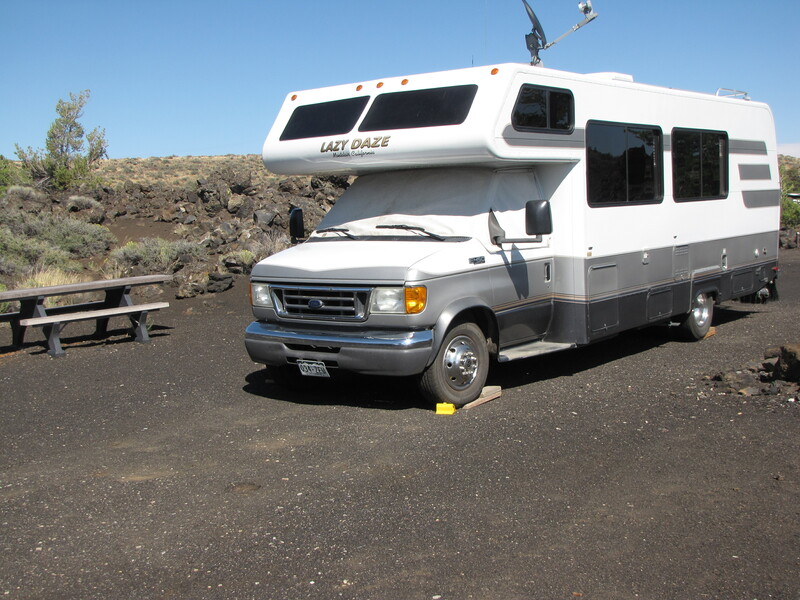 ), WiFi and full hookups. 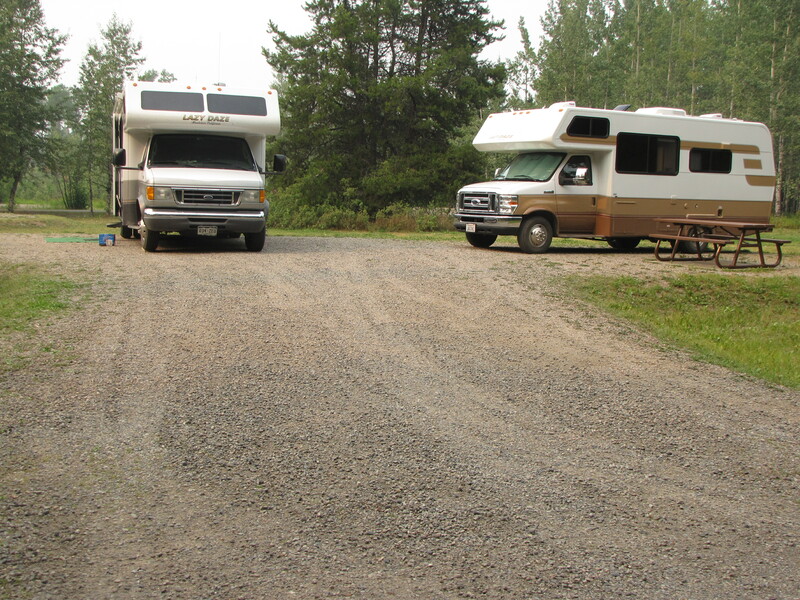 The next morning we left here under a very smokey sky – fires in BC. We drove on the 1 towards Hope, where it is very dry and desert-like. The next part of the 1 is very pretty, but has a very long downgrade. 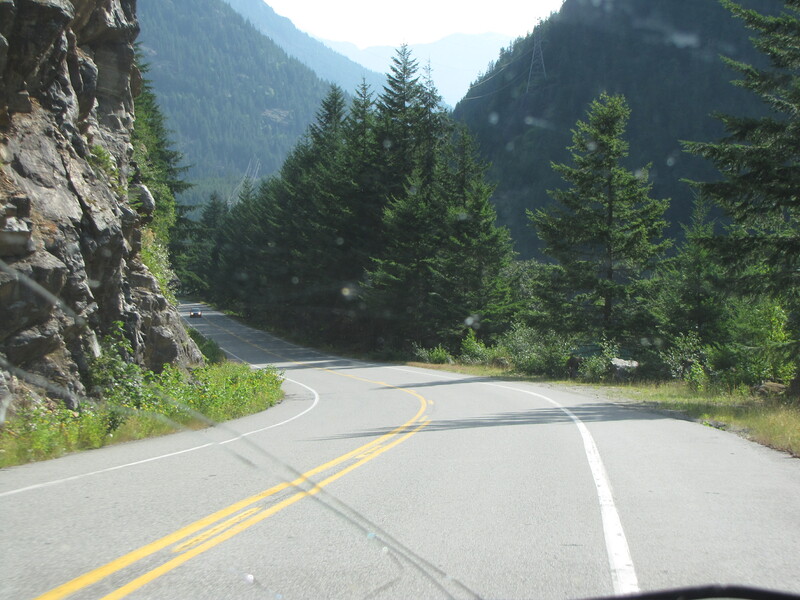 You drive through beautiful scenery and 7 tunnels through Fraser Canyon – Yale, Saddle Rock, Sailor Bar, Alexandra Tunnel, Hell’s Gate Tunnel, China Bar (built in 1960 is one of longest tunnels in N. America), and the last one I couldn’t find anything about, and didn’t see. 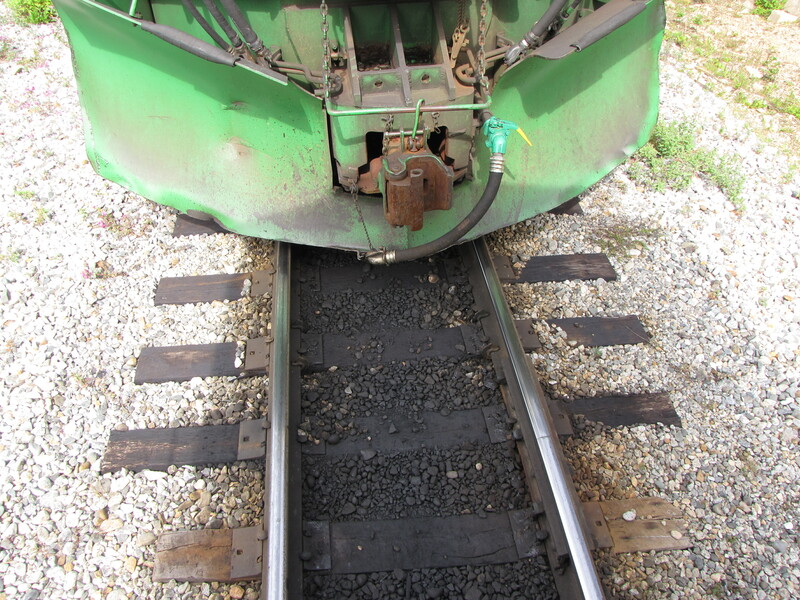 This is also know as the Gold Rush Trail. 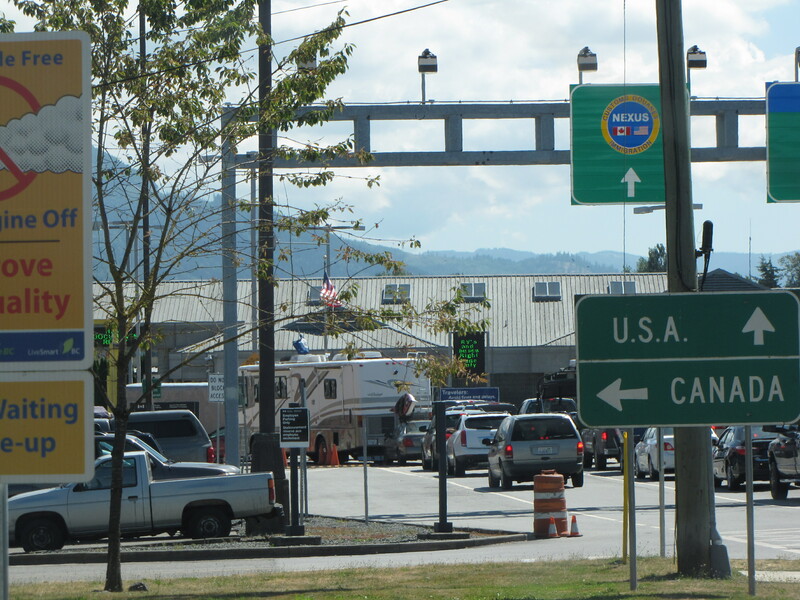 From here we headed to the Abbotsford border crossing to enter back into the USA. We had a 45 minute wait, but not problems crossing back in. 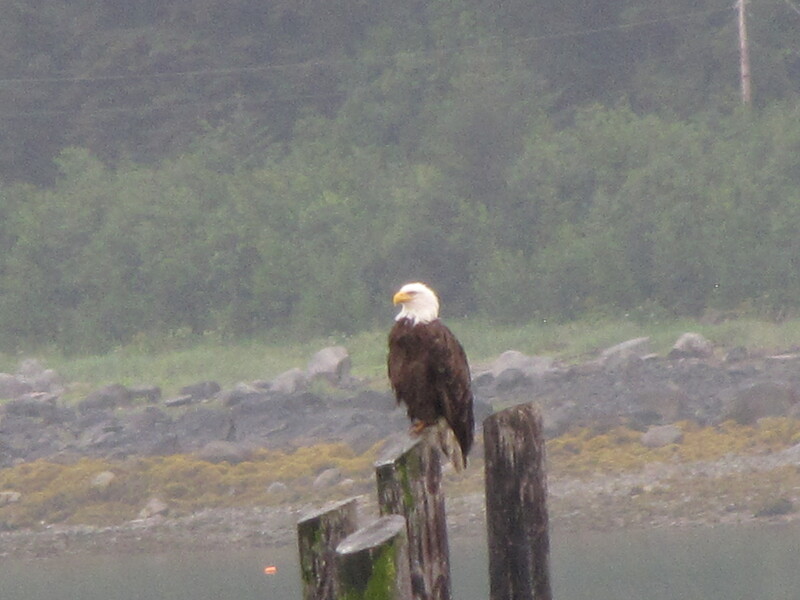 We entered into Canada on 6/15/14 and entered back into the USA on 8/16/14. From border to border we traveled 6,106 miles. Next post will be travels back in the US. 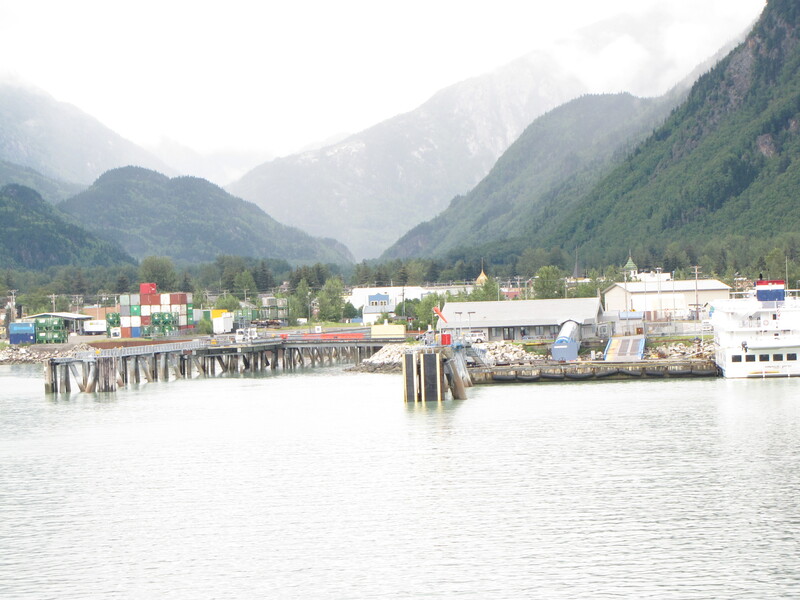 After spending two nights at the Oceanside RV Park in Haines, we headed for the ferry terminal for a one hour trip to Skagway. 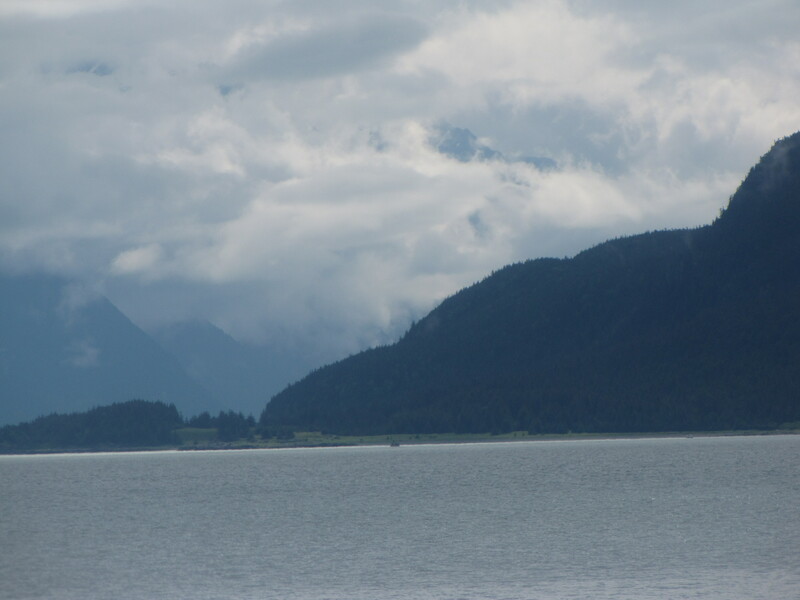 It rained almost the whole time we were in Haines. 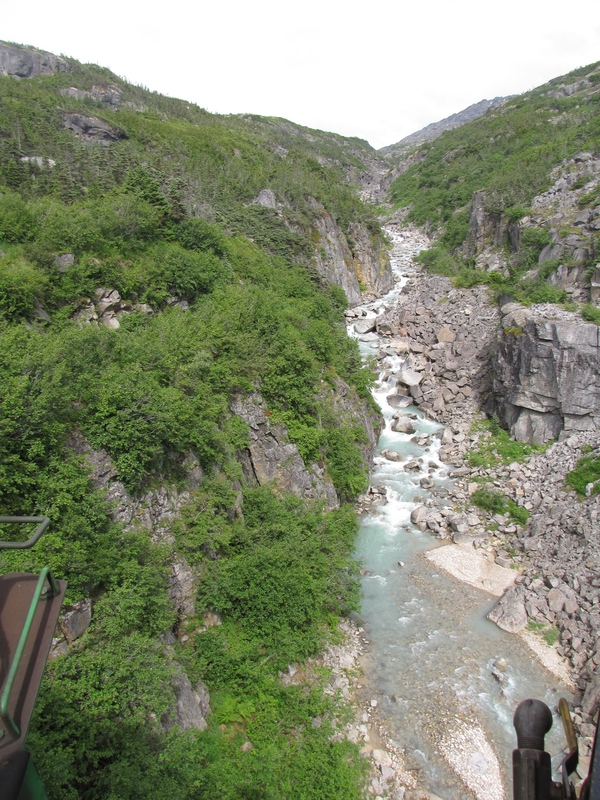 The view was fantastic crossing the 14 mile channel to Skagway. This was Sadie’s first time crossing water; Kolohe (cat) however crossed from Kauai to AZ for his first trip and this was his second. 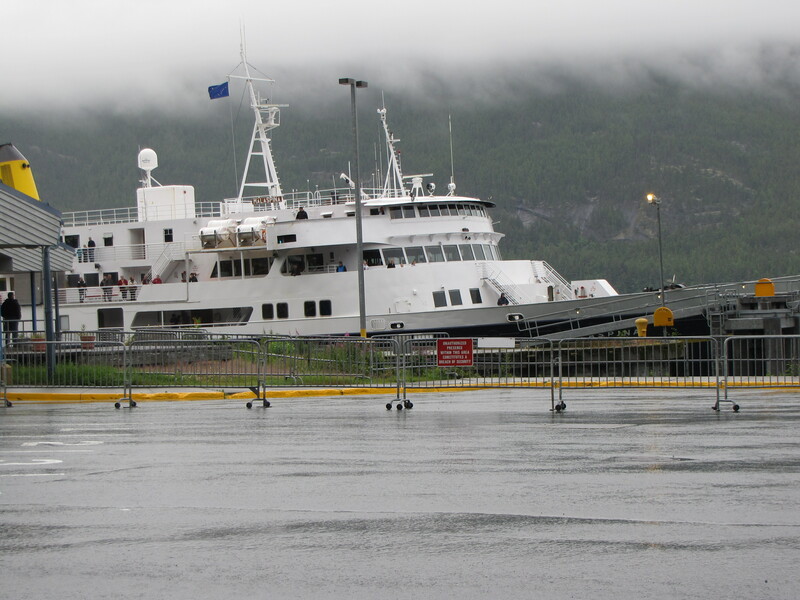 There was one cruise ship in the harbor when we got into Skagway, but there were 4 by the time we got up the next morning. 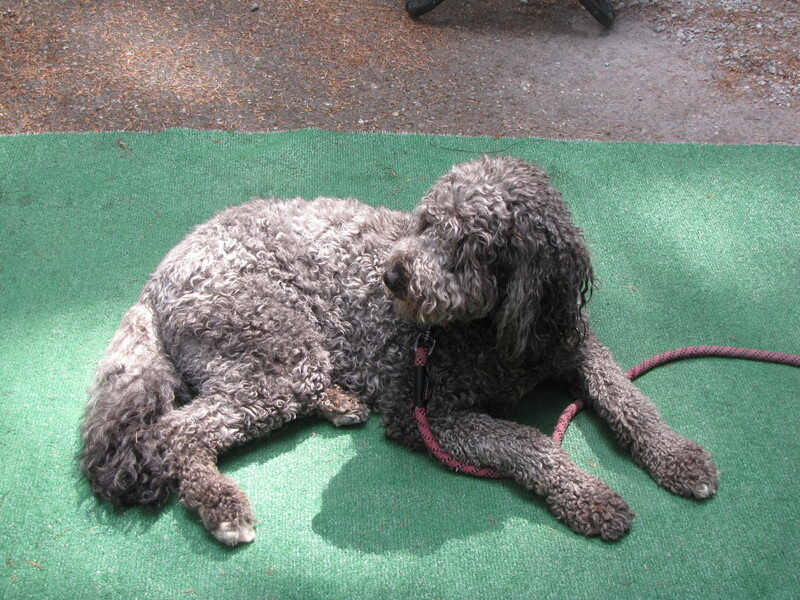 We had reservations at Pullen RV Park which is right near the harbor, train station and town. 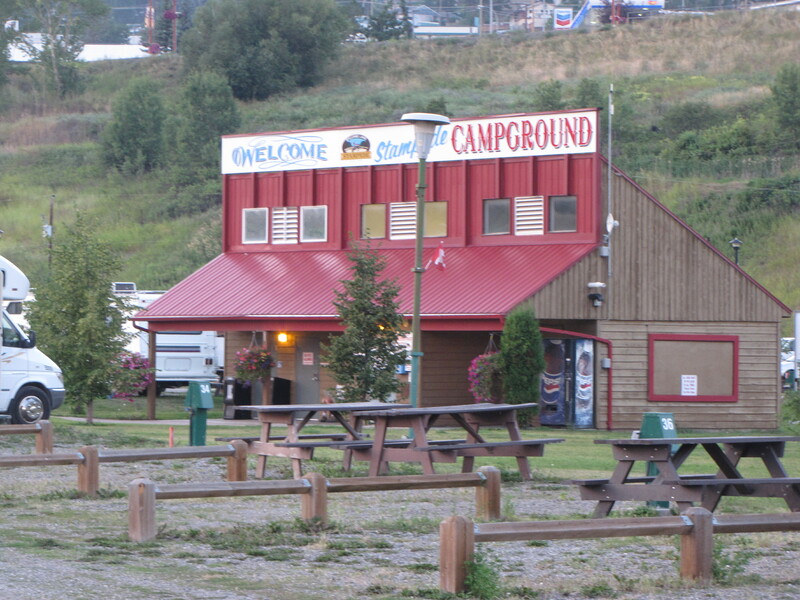 It was not the greatest campground, however. 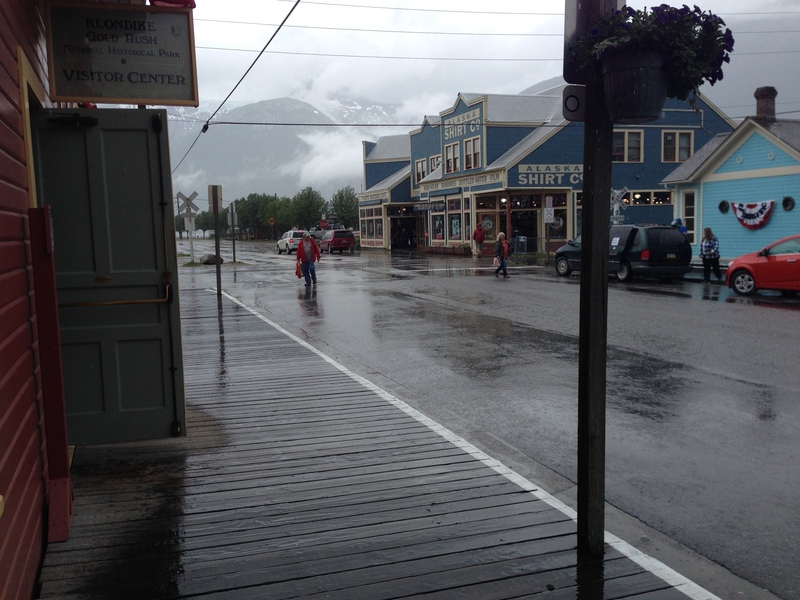 We walked around Skagway which is very touristy, but cute. They have made the shops so they remind you of Main Street, Disneyland. Again, you can see it’s raining. 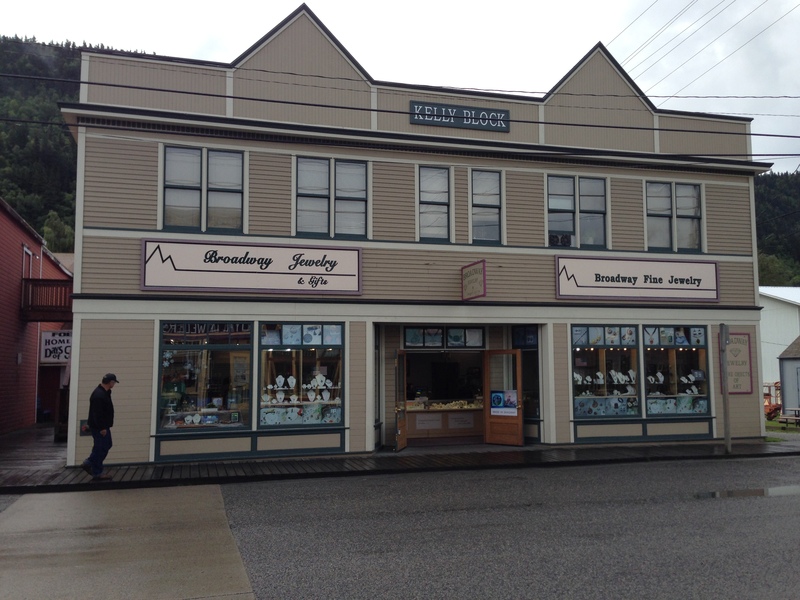 One of my ex students used to work at a cruise-owned jewelry store here in Skagway. So I found the store and then found these ladies who had known Dennis. I sent the pictures to him. 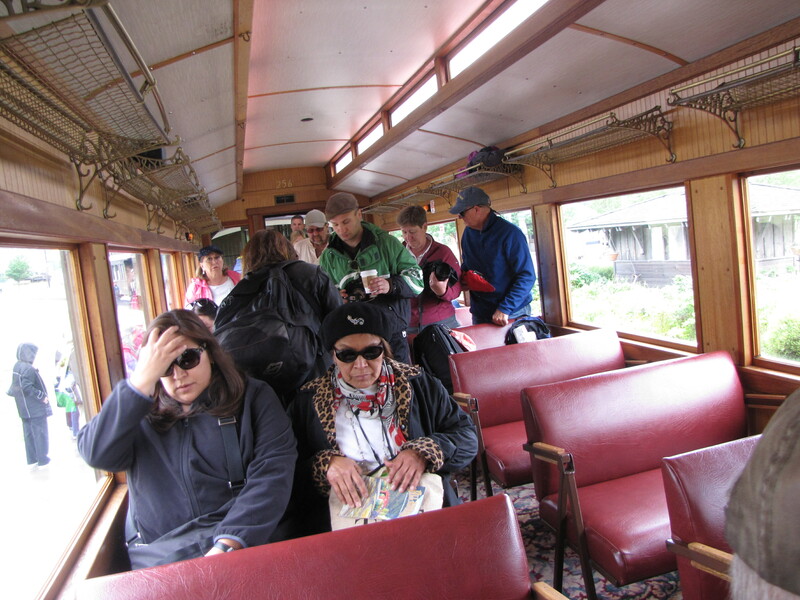 The next afternoon we had reservations on the White Pass Narrow Gauge train. This is a 3 ½ hour trip to White Horse Pass. Several people told us you shouldn’t miss it. 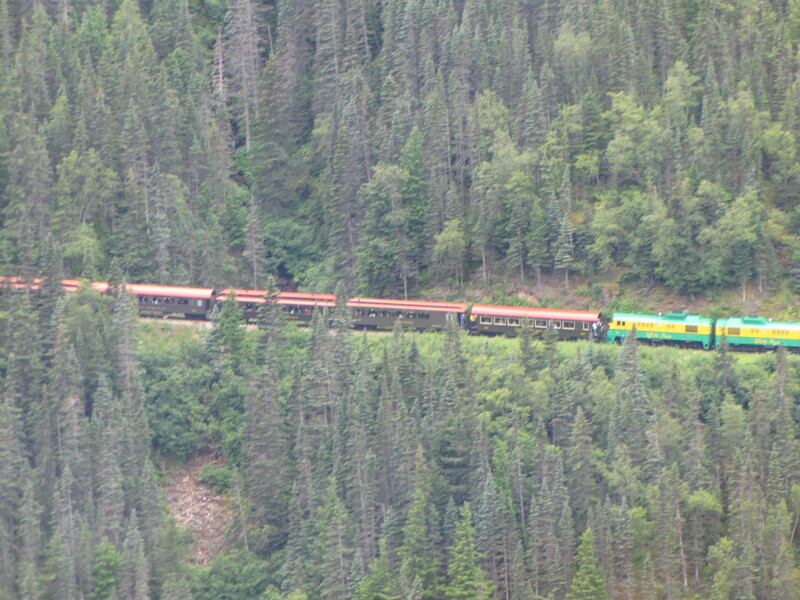 It was a slow moving train since it had to climb towards the pass, but we saw some beautiful scenery. Thank goodness the rain had stopped and the views were spectacular. 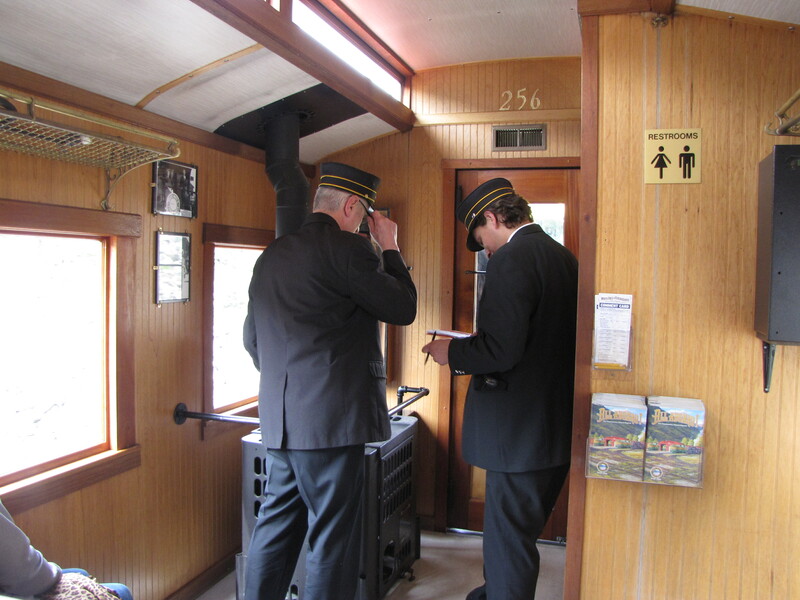 There were even real conductors. 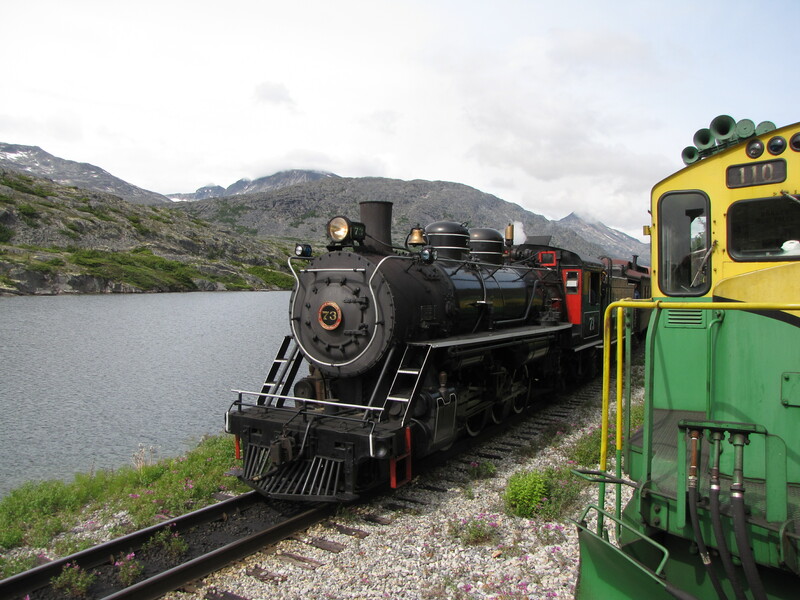 At the top, White Pass, our engine broke away from the train and then moved to the end of our train to pull us back to Skagway. That meant everyone inside had to change sides and flip the backs of their seats so they are now facing forward. Crazy, but it worked. 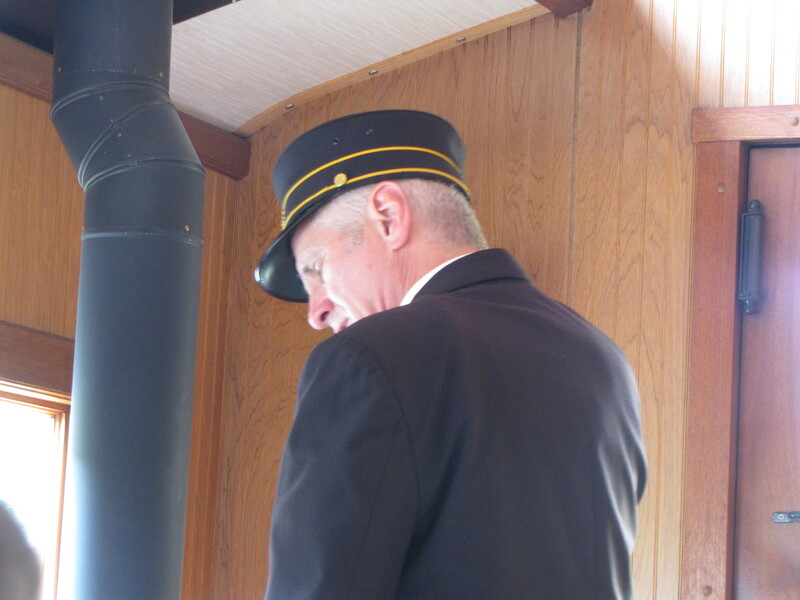 While we were sitting and waiting for the engine to reattach when we got a great view of a real steam engine pulling the train that traveled past us. On the way back we were able to get pictures of things that we missed on the way up. 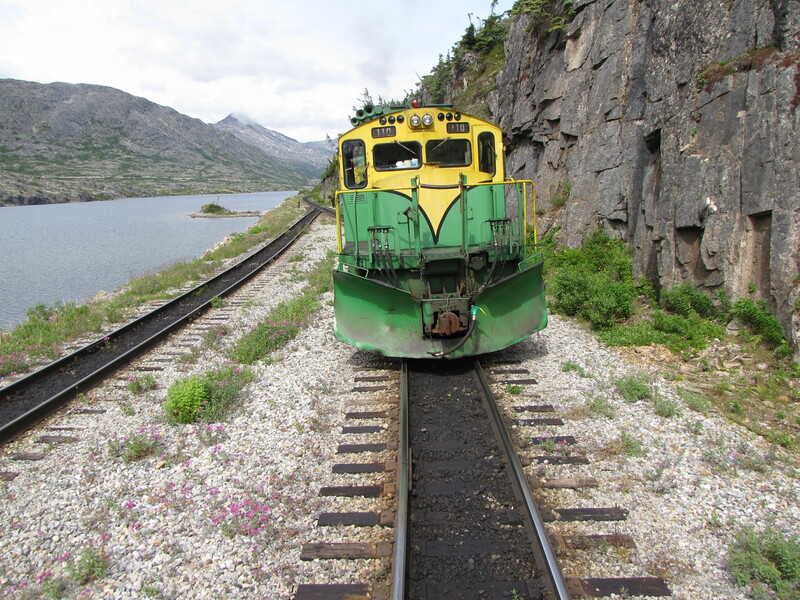 A glacier, fireweed, train on lower track, and a view back to Skagway. 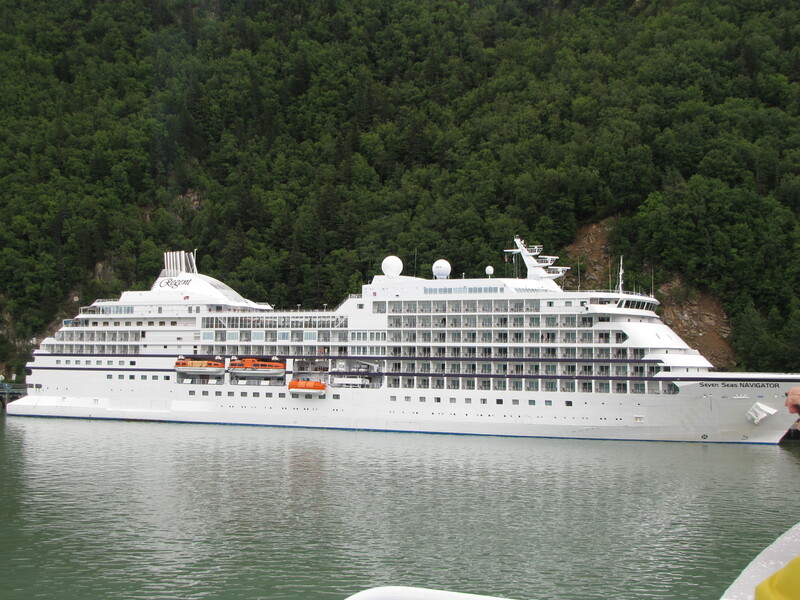 One of my students, Dennis, is a jeweler and used to work in Skagway through a cruise ship line. So I went to the store to see if anyone there remembered Dennis, and these two ladies did. So, I sent their pictures to Dennis along with the front of the store. 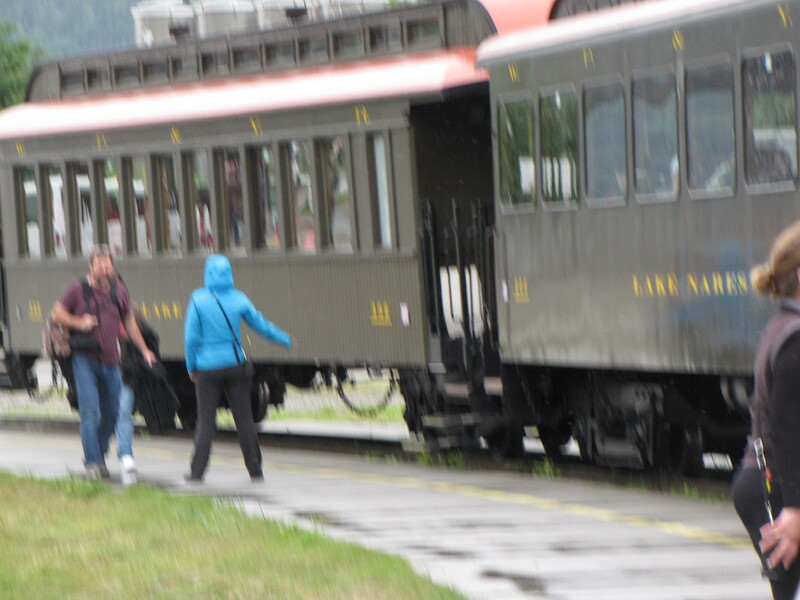 After getting sourdough bread and cinnamon rolls at the Lemon Rose bakery in Skagway. 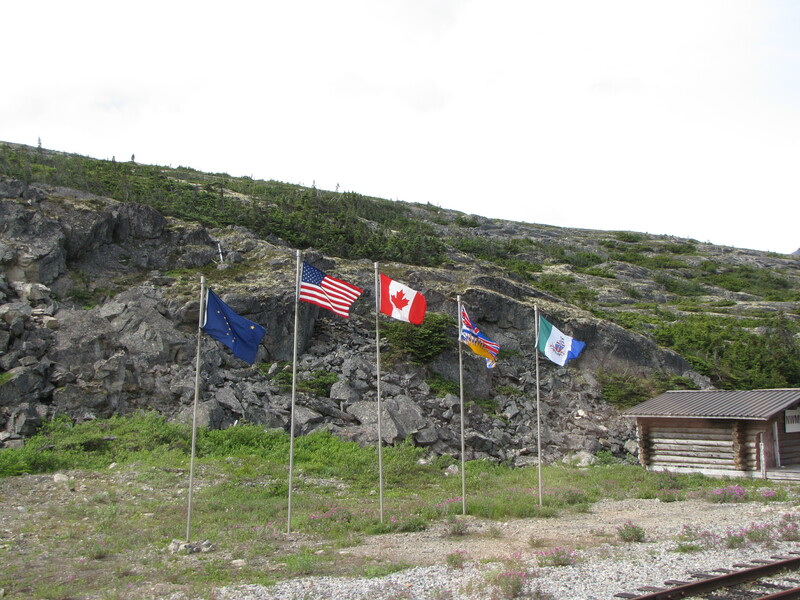 Then having dinner at the Skagway Fish Company where we had the best halibut fish and chips we have ever had, we headed out on the Klondike Highway. 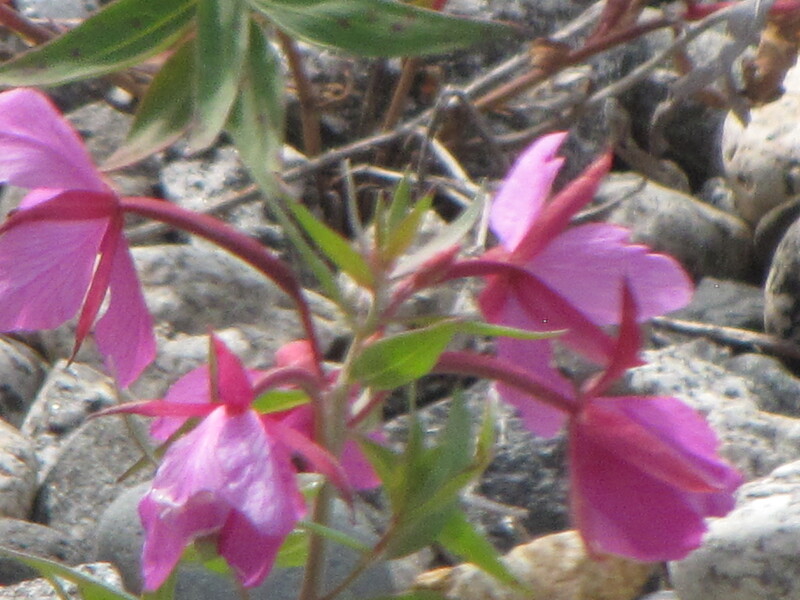 Next post, on our way out of Alaska, Yukon Territory and Canada. 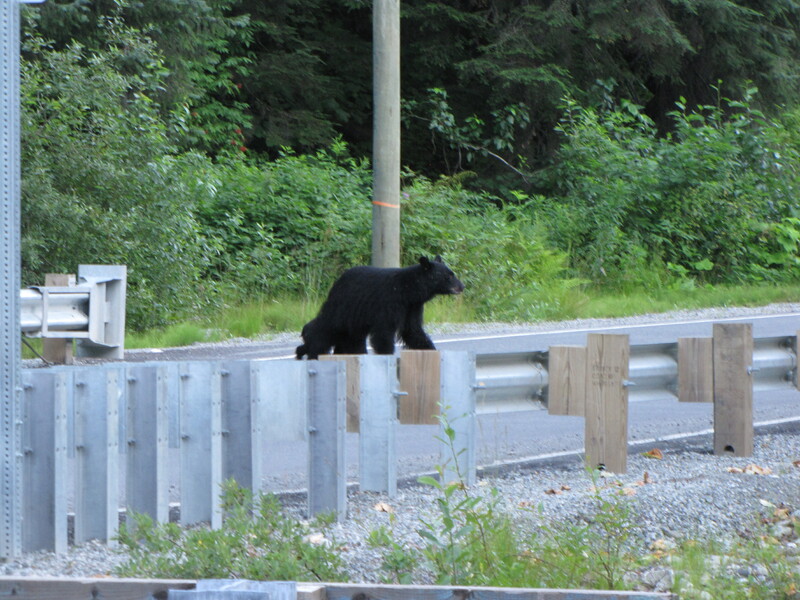 We sadly left the Bear Paw II in Valdez, and headed North on the Richardson Highway. 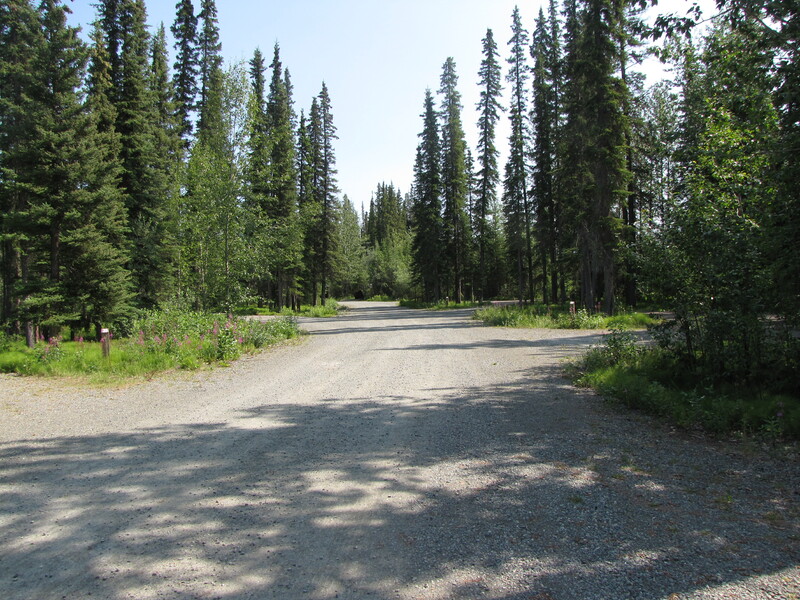 We took the Tok cutoff and ended up at Tok. 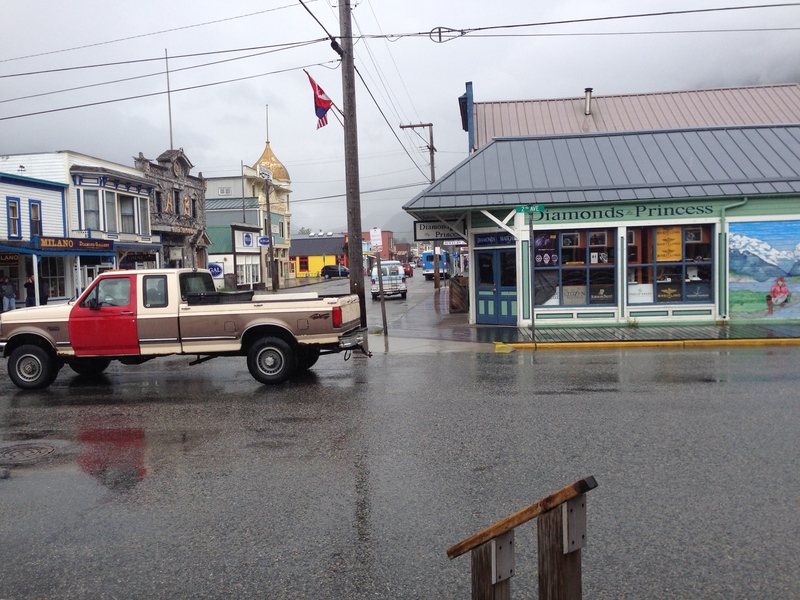 We decided to stay at the Chevron Gas Station, where we previously stayed when we were in Tok. 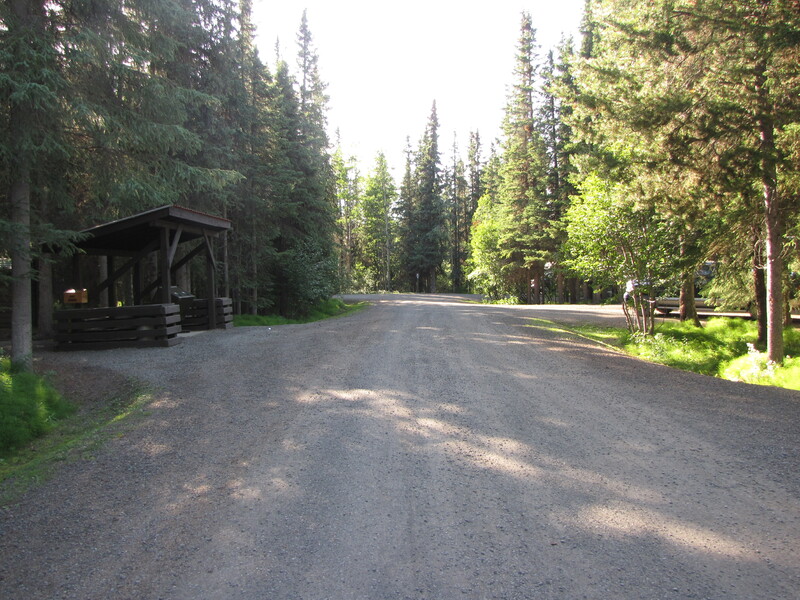 Before leaving Tok, we went to the Sourdough Campground where they had an eat all you want sourdough pancake, sausage and drink. These were OK, but nowhere near as good as the ones from Copper Center. 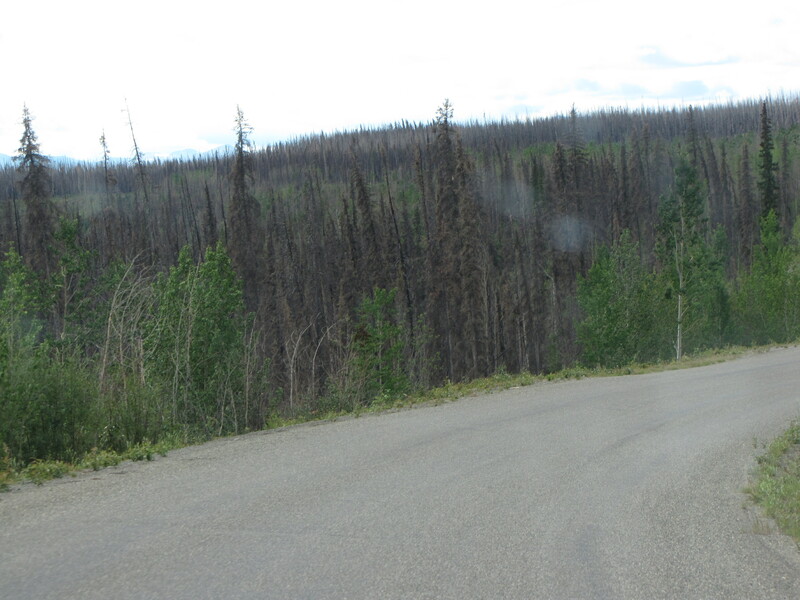 Heading East on the AlCan, we came across the WORST roads we have ever driven on. 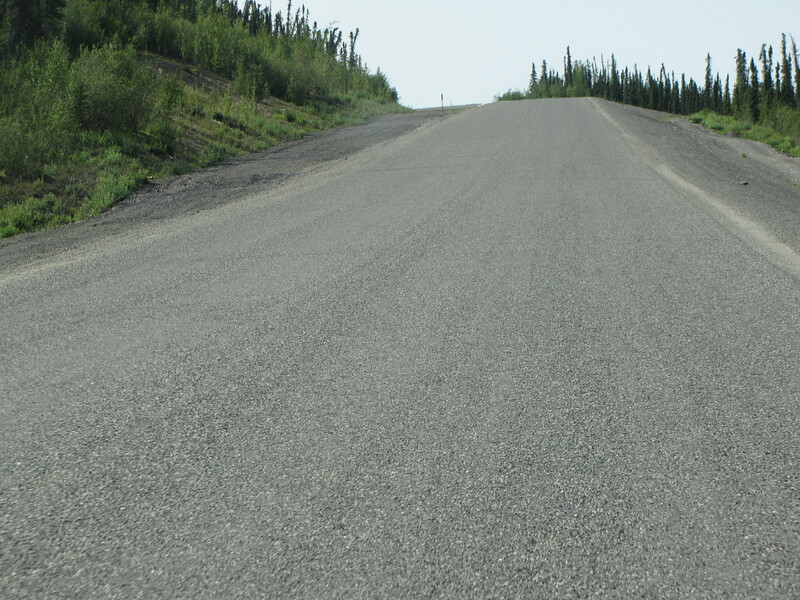 75% of the roads in the Yukon Territory were either full of frost heaves, or cement roads ground down and the rocks left on the road. We had to drive no more than 35 miles an hour. 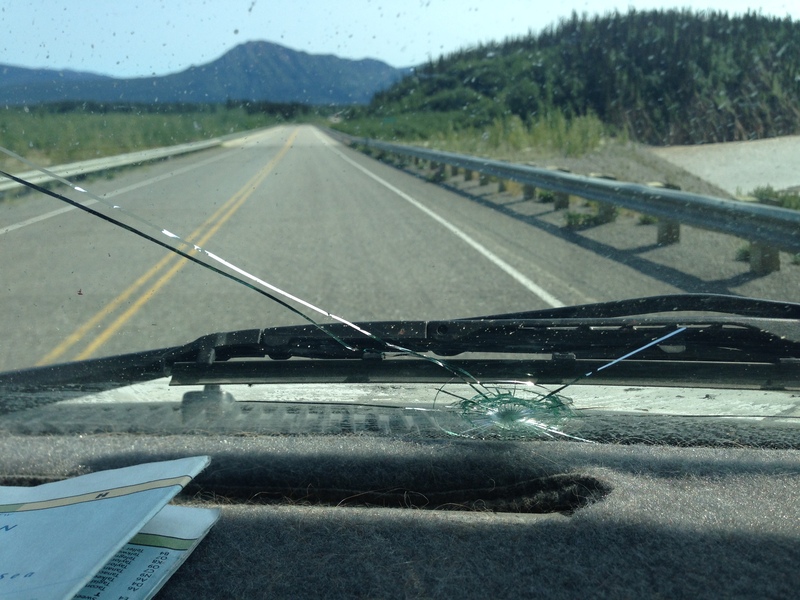 Unfortunately the 18-wheelers drive very fast and throw up rocks and one hit our window. You can see from the picture that it was about the size of an orange and had cracks spreading out. Most definitely a new front window in our future. 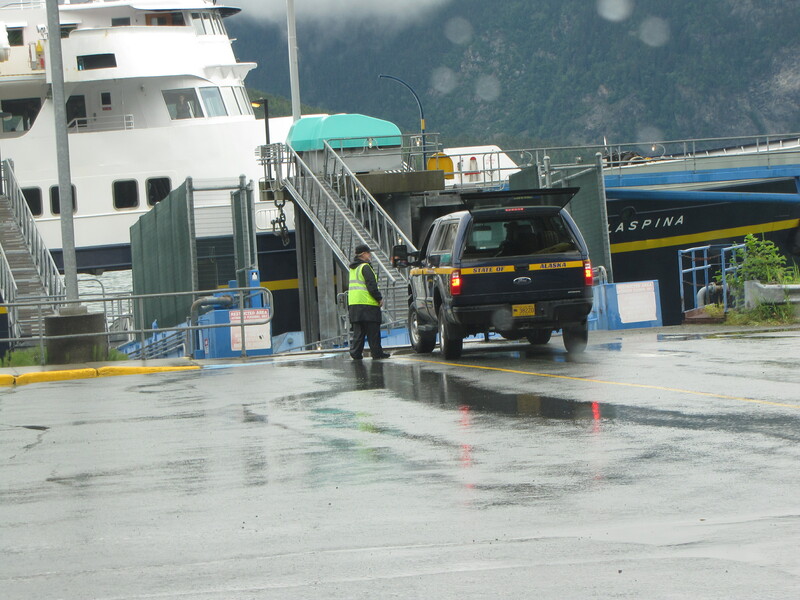 We would suggest not driving through Yukon Territory and drive into Haines and take a ferry. 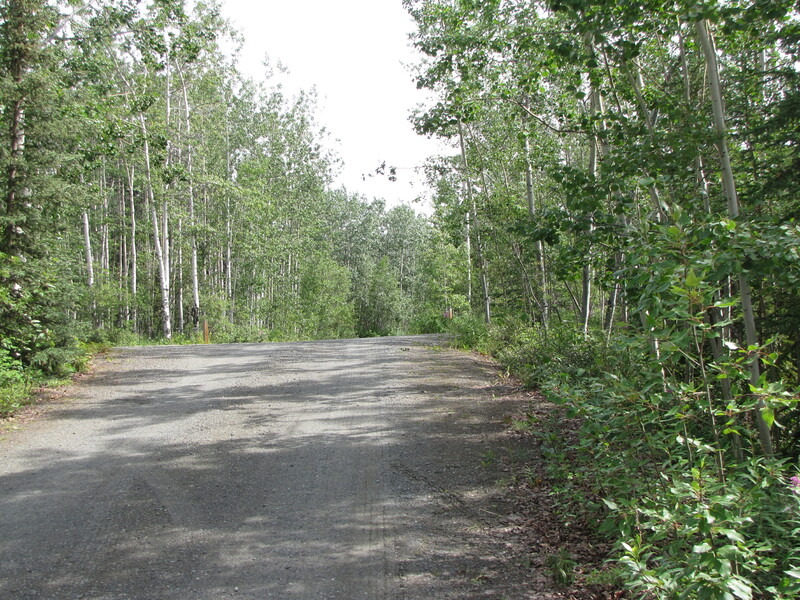 A local Forest Ranger told us that the Yukon roads are ALWAYS torn up. You can’t believe the wear and tear on our rigs. 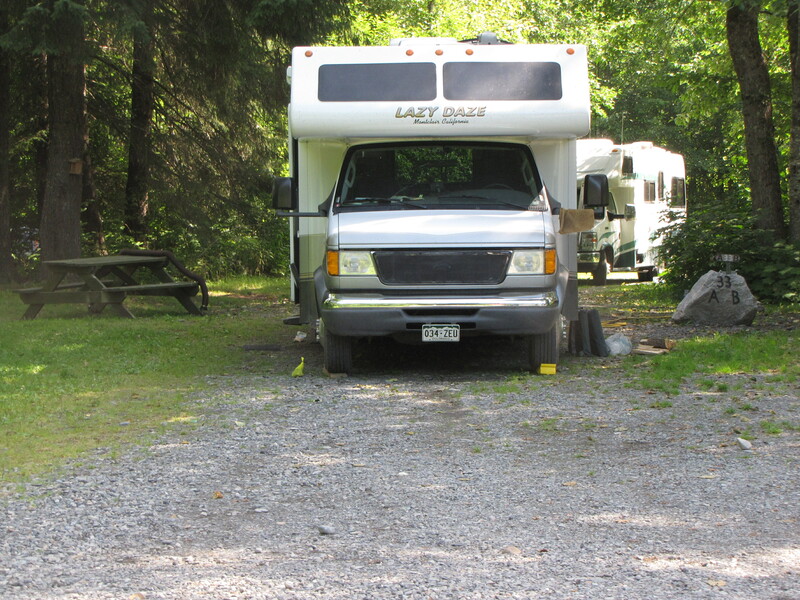 We stayed this night at Lake Creek Campground. 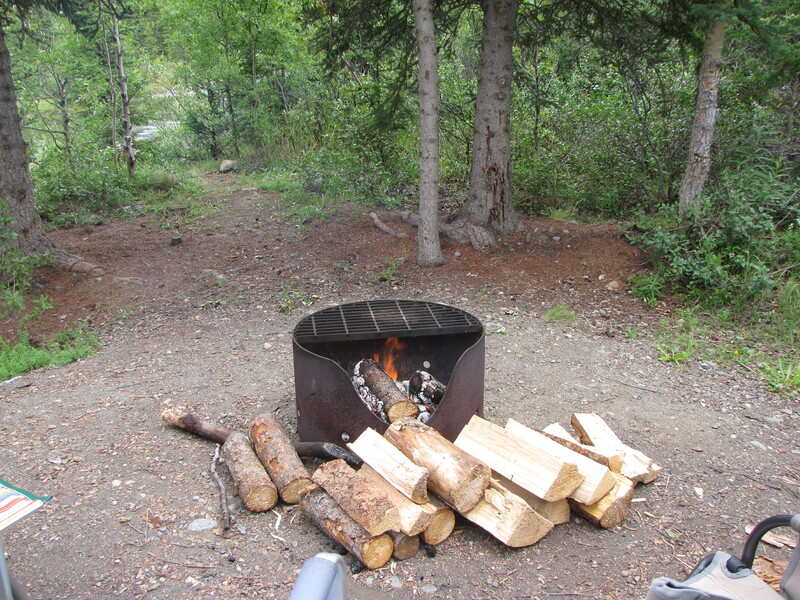 The road in was not very good, but the sites were big and well separated and they had free firewood. We left the campground by a very pothole ridden road and got back on Hwy. 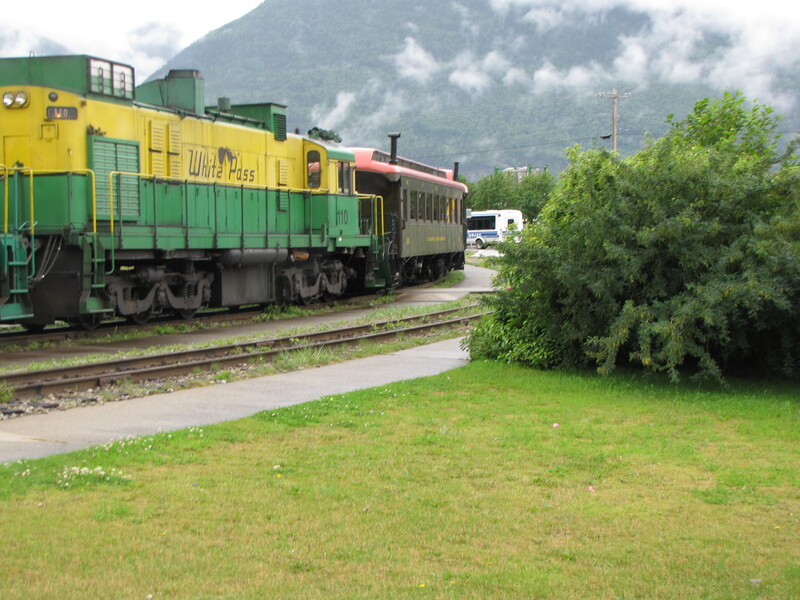 1 heading towards Haines Junction. 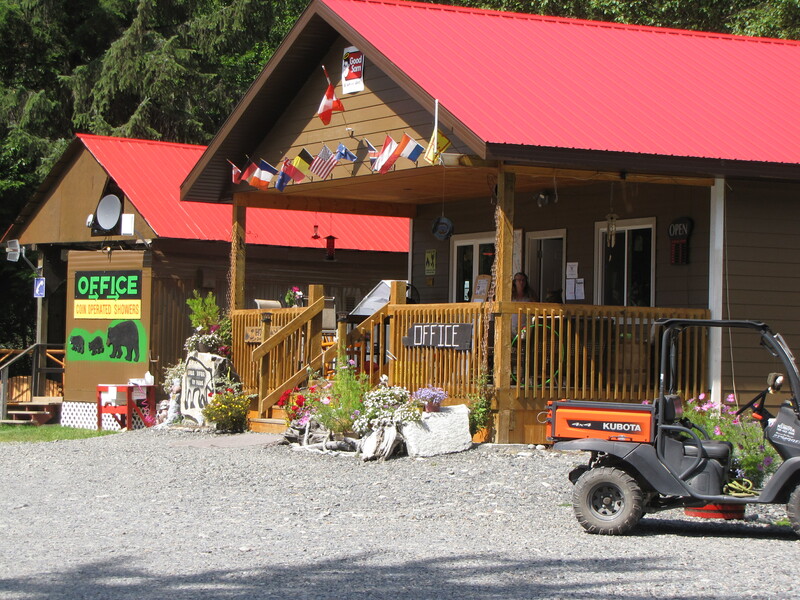 We stopped at Village Bakery, in Haines Junction, and got a loaf of cheddar dill bread – delicious. Traveling south on Hwy. 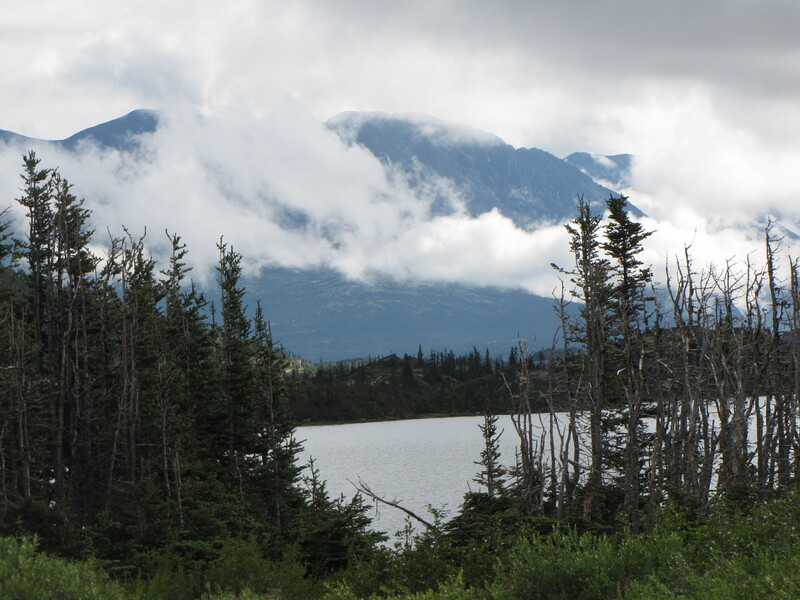 3, towards Haines, we spent the night at Kathleen Lake Campground. 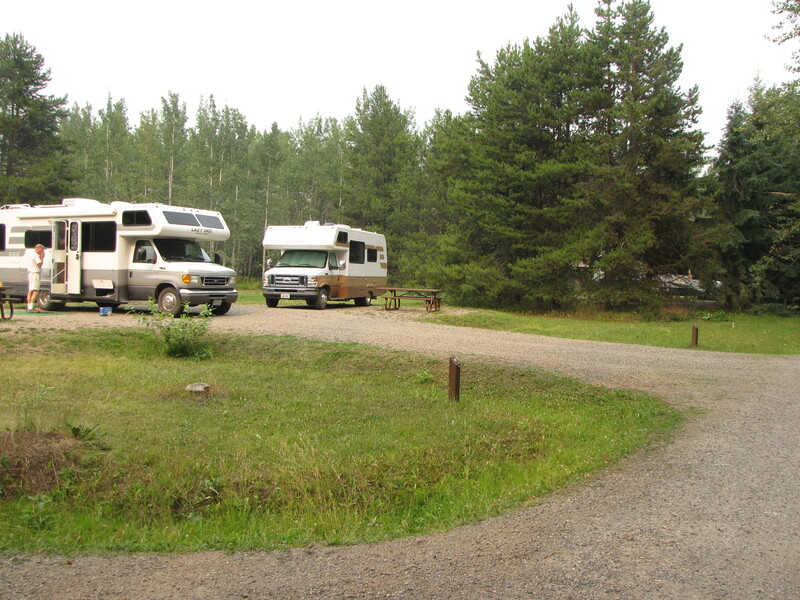 This was a very well maintained campground with large sites. It was also very quiet. 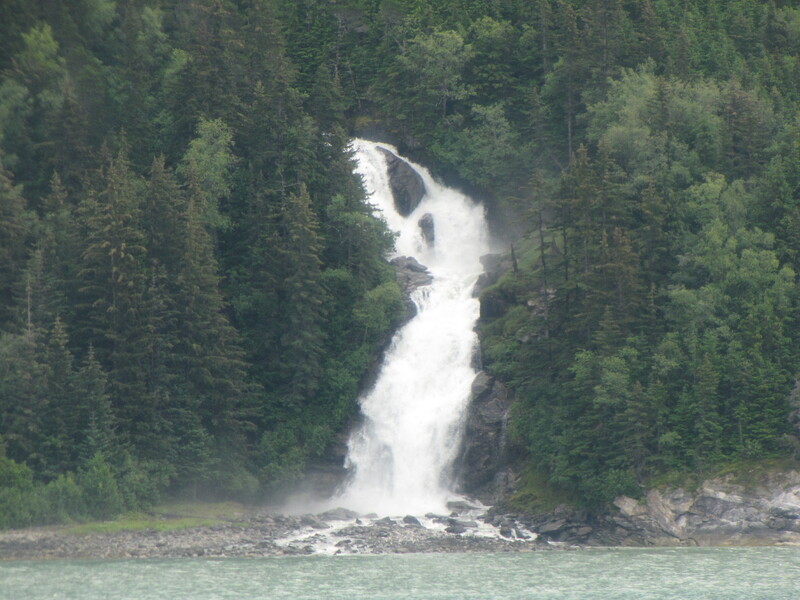 Continuing on the road towards Haines, we spent the next night at Million Dollar Falls Campground. 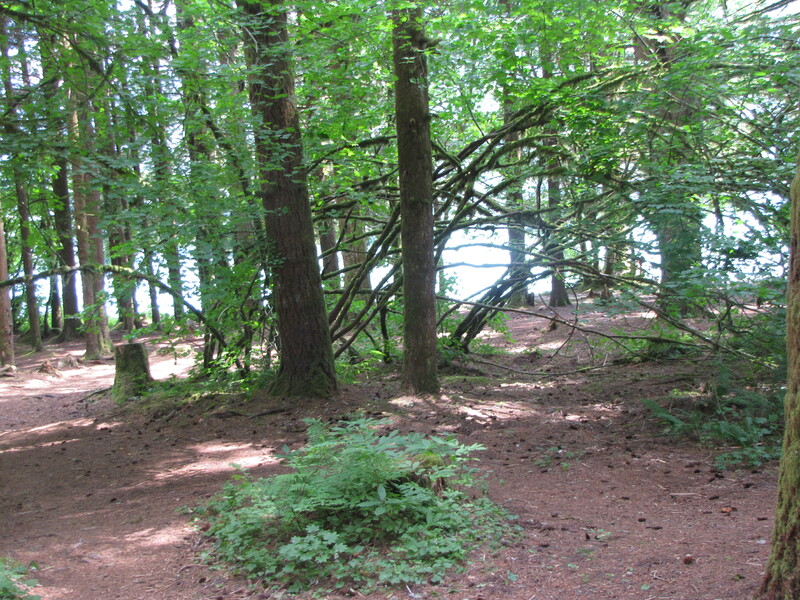 Spaces are well separated with trees and natural vegetation..We were able to have a fire here. 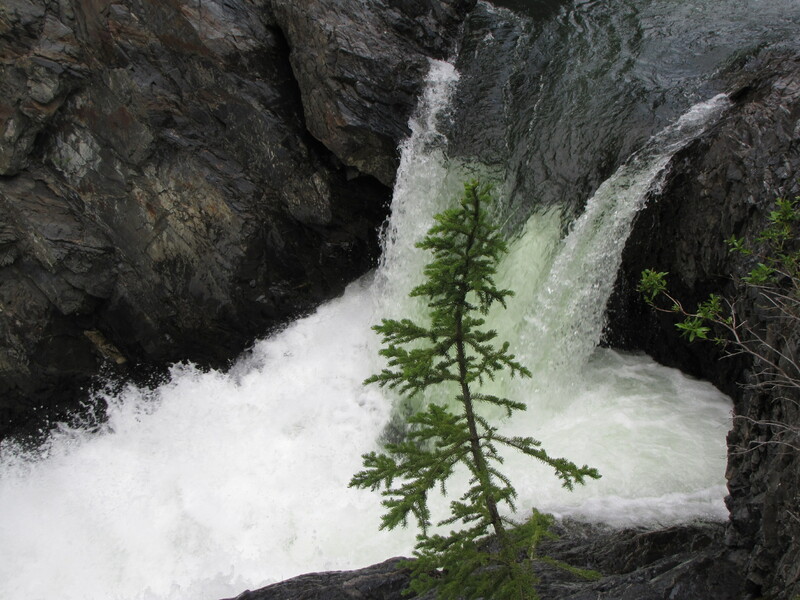 While there we took a ½ mile walk to see the Million Dollar Falls. 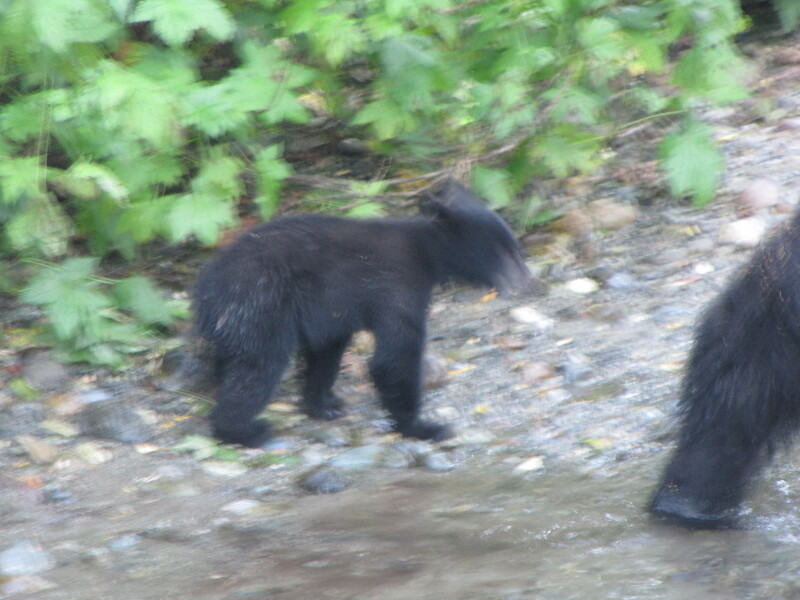 There were very nice, but the ones we saw at Wells Grey were so much better. 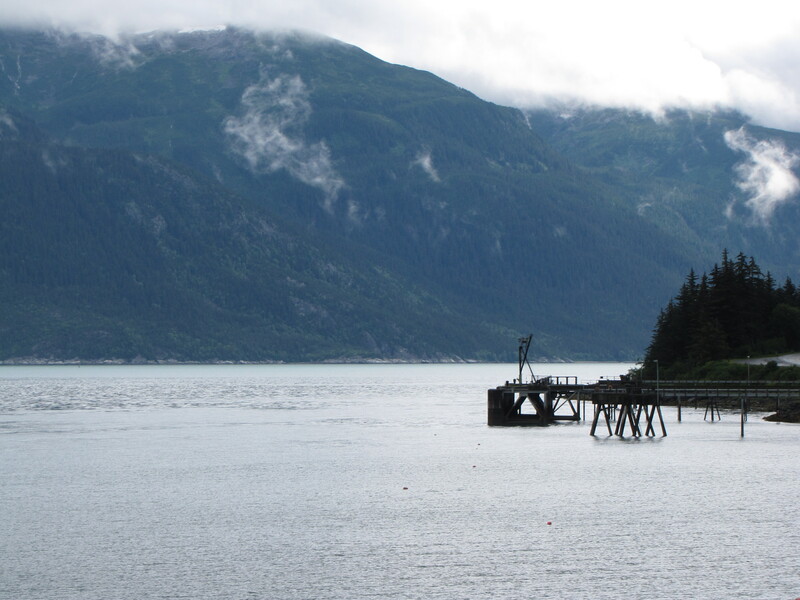 Our next stop was Haines, Alaska. 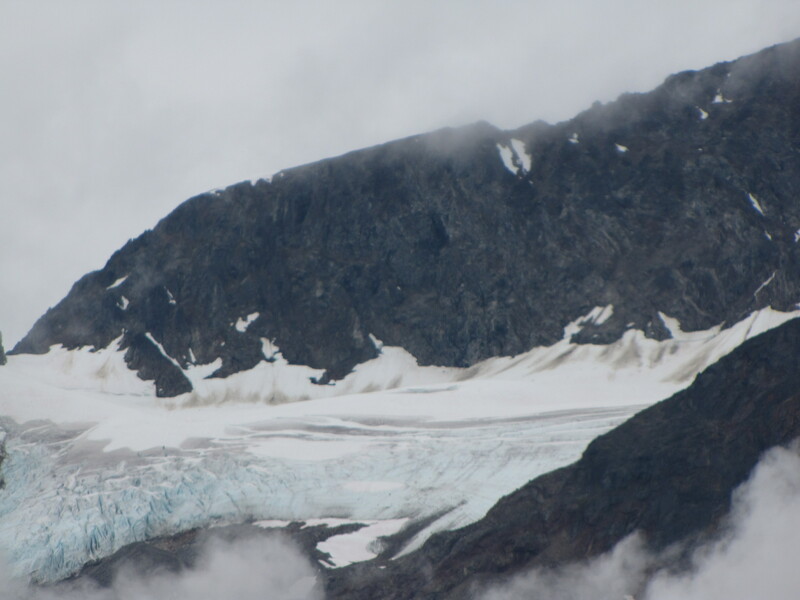 We got here and found out they had two 5.9 earthquakes last night and the fiber optics between here and Juneau was broken, so we have no cell phone service or internet. The library is the only place in town that has internet so we went there to check mail before going to our campground. 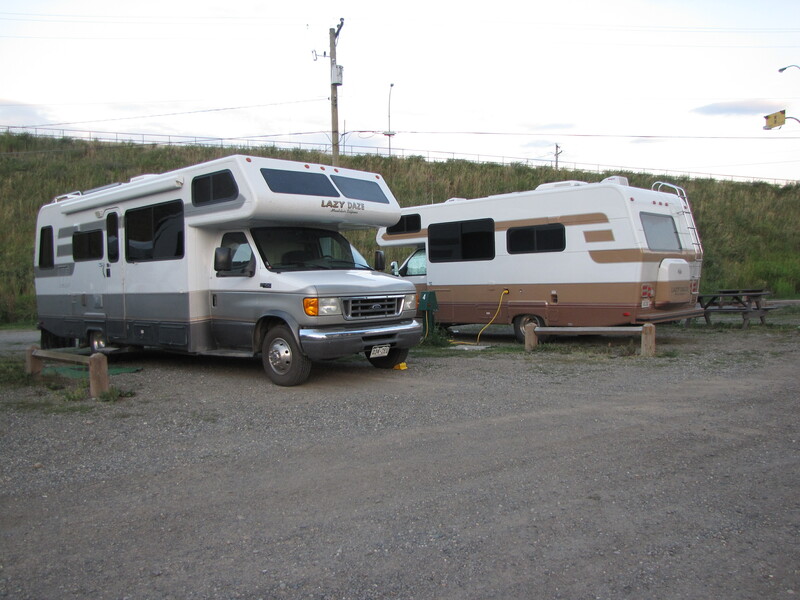 We had made a reservation at Oceanside RV Park, which is centrally located on Main Street and right on the water. 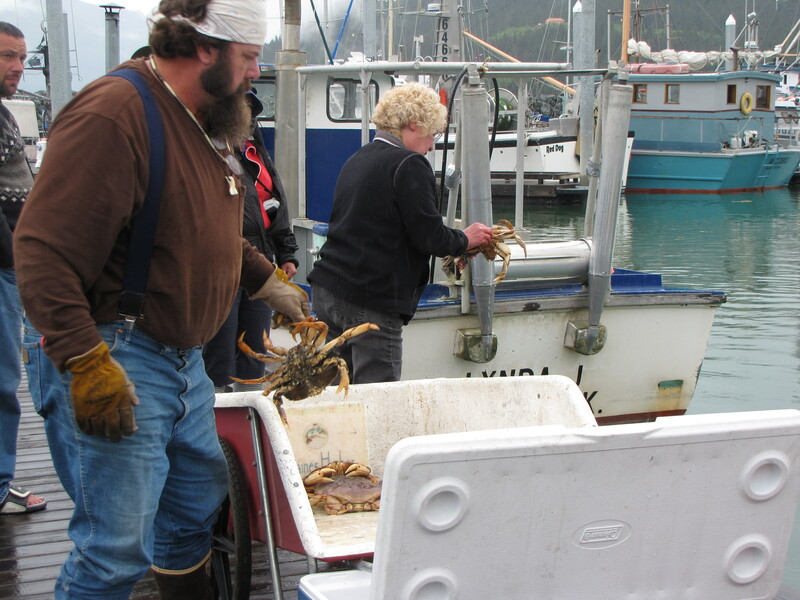 We heard the enthusiastic owners sometimes have crab potlucks and we are lucky – they had one the Saturday night we stayed there. 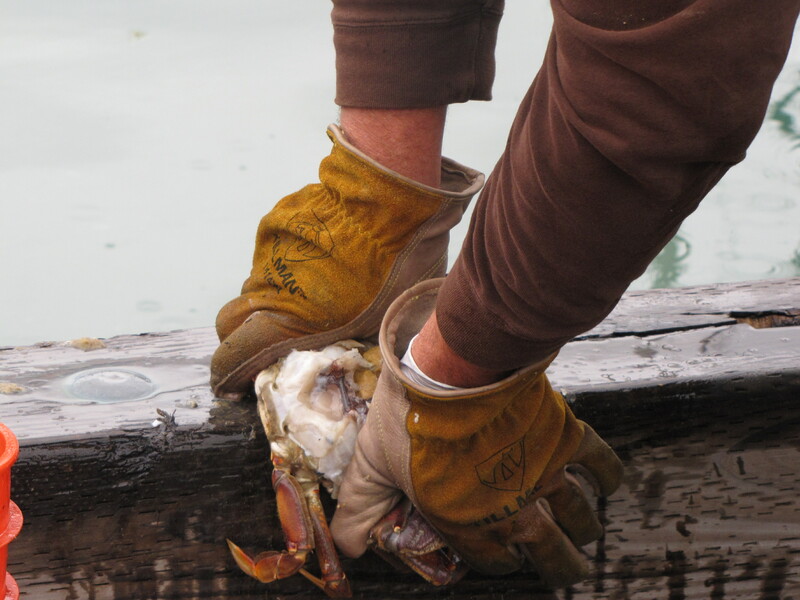 We have to bring a side dish and pay $10 a person for the crab. 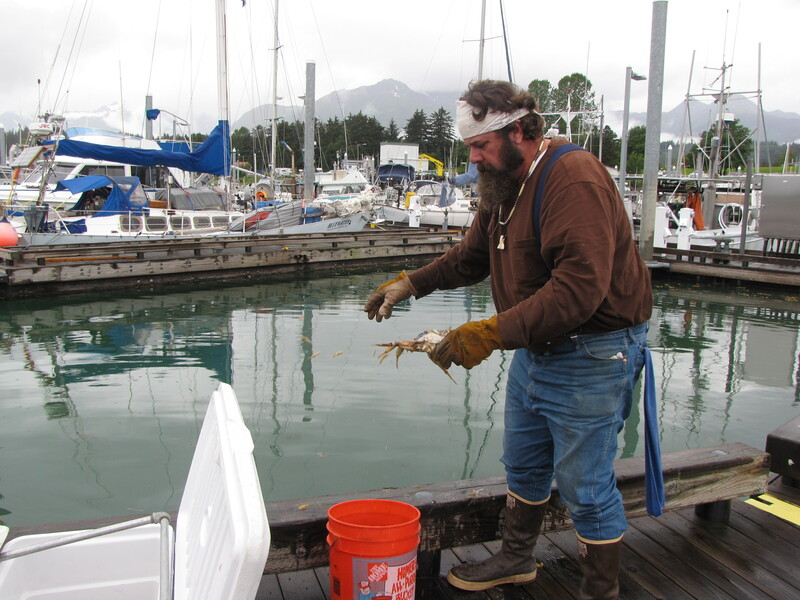 They bought the crabs live at the cannery and then brought them back to harbor to break in half and clean. 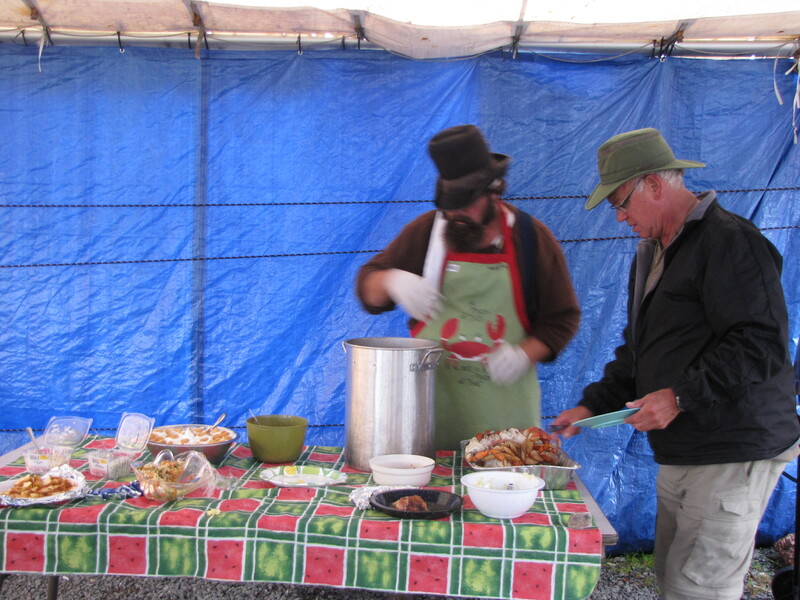 The crab potluck was wonderful. 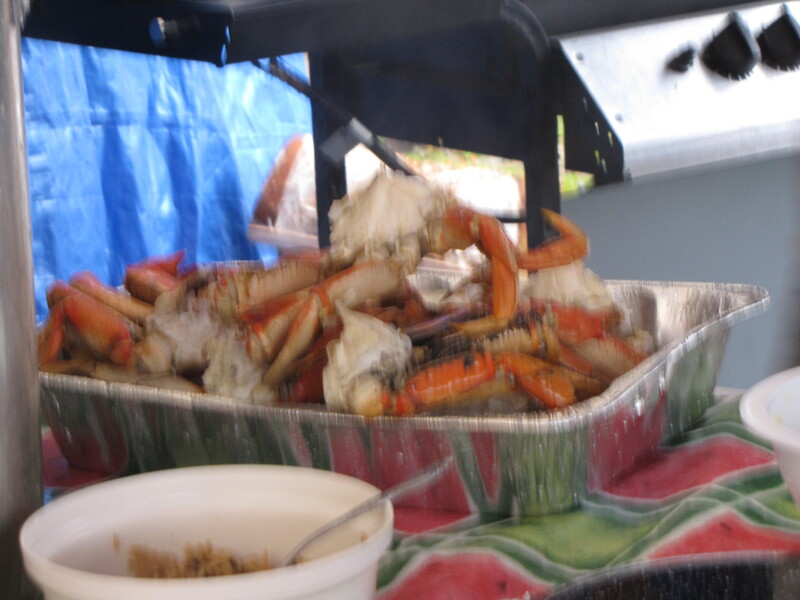 We each got a whole crab, and then enjoyed the potluck items everyone brought. 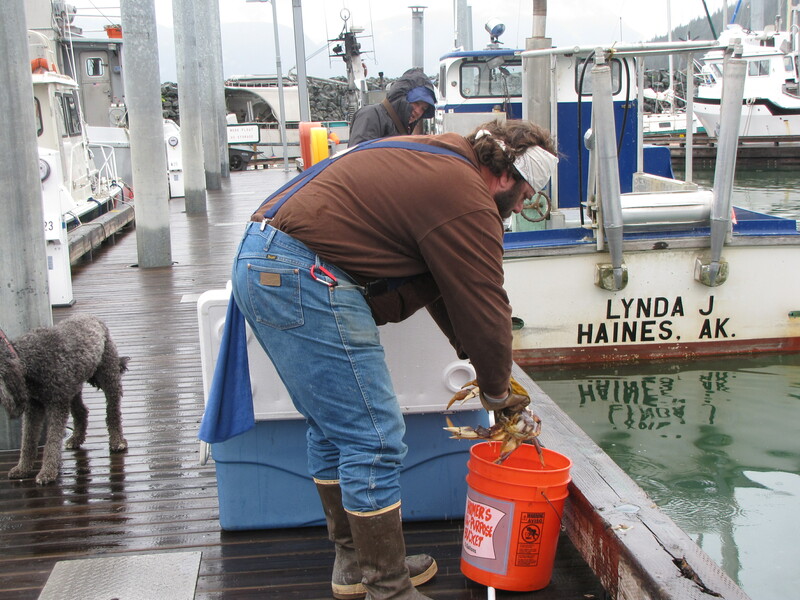 Then Joyce (the owner) came around and gave us fresh salmon that she had cooked. It was a lot of fun and we met lots of nice people. After dinner I was looking out at the bay, and this is what I saw. 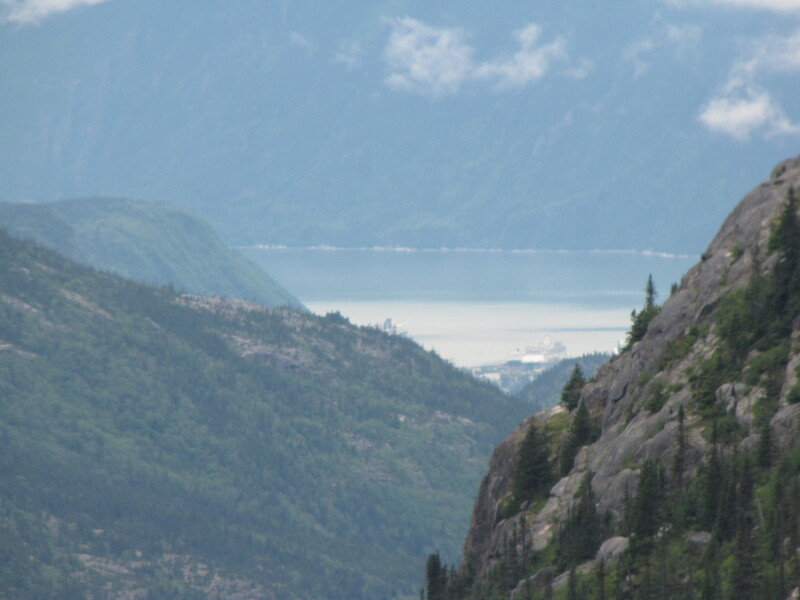 Next post will be our trip to Skagway.